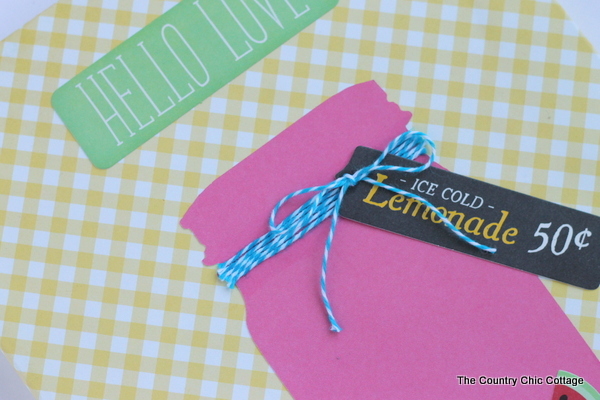 So I am in love with free printable mason jar tags. Y’all seem to love them too so it is okay! My next set are for mason jar wedding favors. 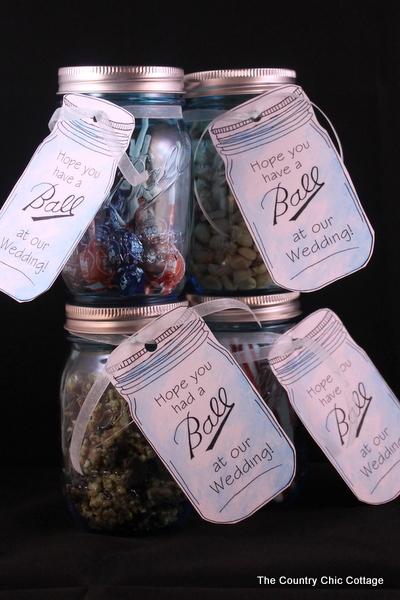 Your guests or wedding party will love being given a favor in a mason jar with a Ball jar tag. In case you want these Ball jar tags in other themes, check out my versions for teacher appreciation, bbq party favors, and everyone else on your gift giving list. For the wedding version, I have a few to choose from so pick the one you love below and print in any size you like. Hope you had a BALL at our wedding! Hope you have a BALL at our wedding! It is a BALL having you as our groomsman! It is a BALL having you as a bridesmaid! It is a BALL having you at our shower! 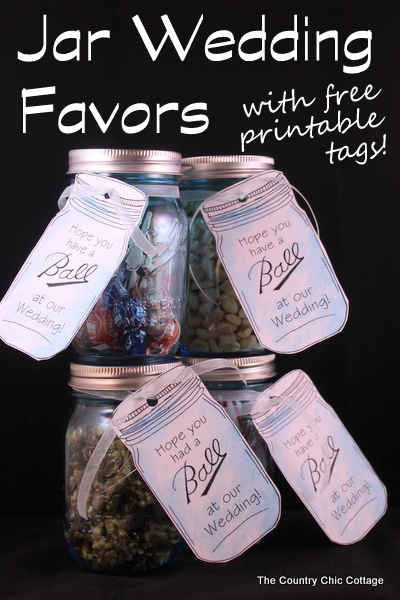 Now just fill Ball jars with your favors and attach your cutout tags. So simple yet your guests will love this cute touch to your wedding. I used the blue jars from the Ball heritage collection for these photos and you can purchase those through this affiliate link: Ball Jar Heritage Collection Pint Jars . 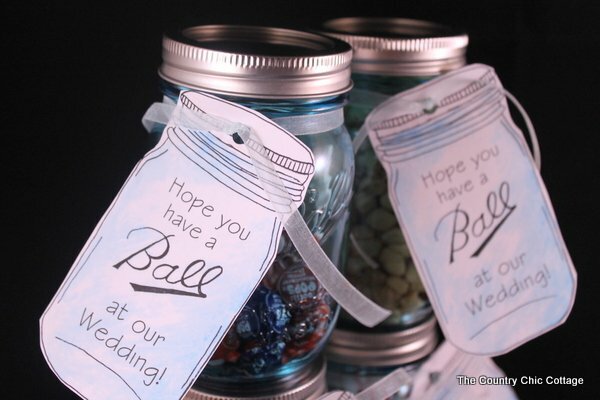 What favors will you put in your Ball jars? I would love for you to email me pictures of the labels in use at your wedding or shower! Enjoy these free printable tags for mason jar wedding favors. I have another fabulous guest for you today. 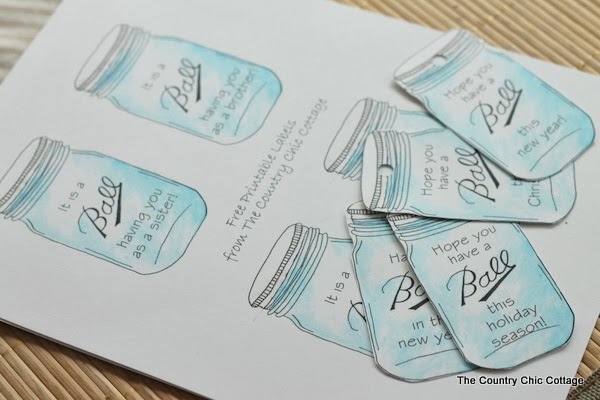 Allie from My Card Party knows that I love mason jars and is stopping by with a fun idea for some canning jar cards. Allie is a brilliant artist with paper so y’all be sure to follow her as well then check out some of her brilliance below. Allie made all of the above cards with those same files. I am in love. The baked with love version is my favorite. What about you? Which one is your favorite? Thanks so much to Allie for stopping by. 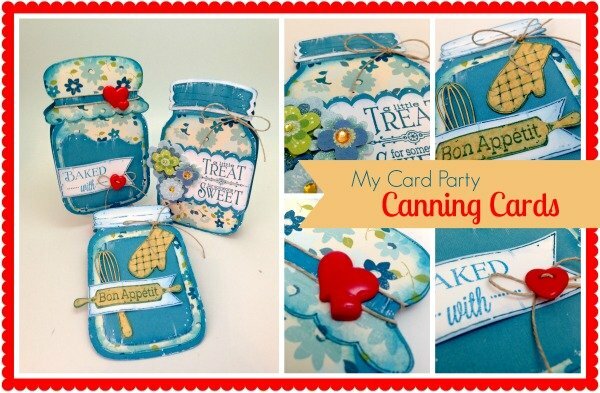 Y’all head over and visit My Card Party and show her some love! 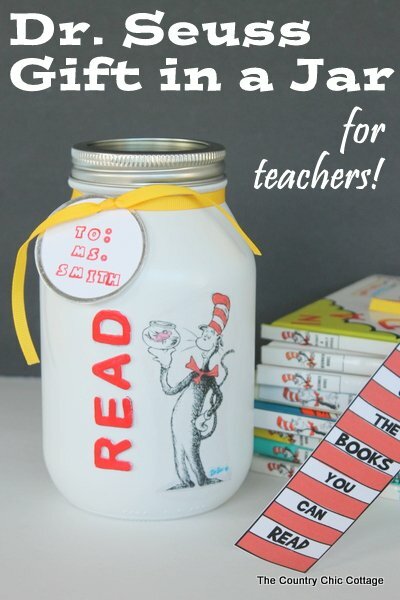 I am continuing on Dr. Seuss week with a great Dr. Seuss gift in a jar for teachers. All this week I am sharing 15 minute crafts for Craft Lightning. 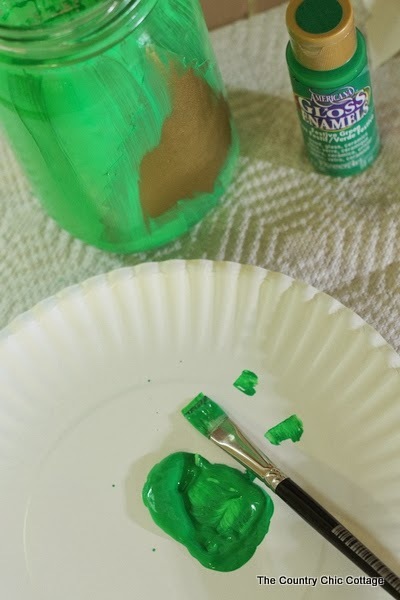 Each morning myself and 30 Minute Crafts will share a quick and easy craft then each afternoon we will round up Dr. Seuss crafts from our series partners. If you want a chance to be featured, be sure to link up your Dr. Seuss crafts to our Craft Lightning linky party. Plus if you have missed any of the fun, check out the round ups from day 1, day 2, day 3, and day 4. Or you can find them all and more on our Dr. Seuss Pinterest board. I just had to add a jar to the mix this week. 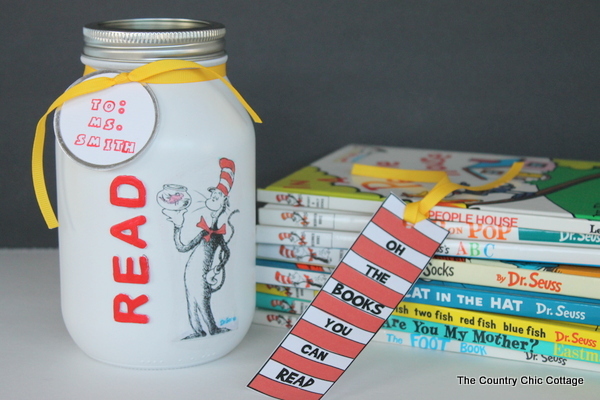 I came up with this fun Dr. Seuss gift in a jar that you will love. 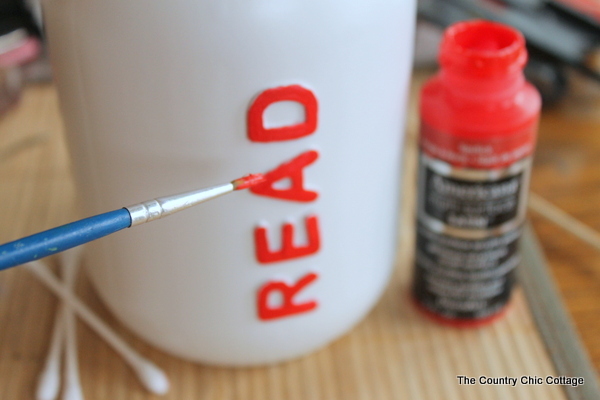 I added foam letters to a clean jar that spelled “READ”. It actually does not matter what color these letters are as long as they adhere to your jar completely and are 3 dimensional. 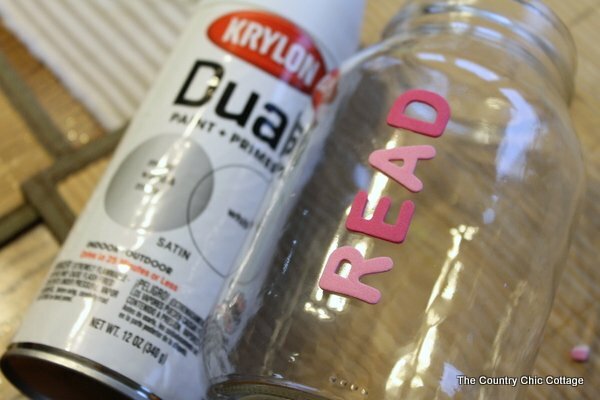 Spray the jar with a few coats of Krylon Dual in white and allow to dry completely. Then brush red onto those letters with Americana Multi Surface in Lipstick. It took me a few coats for complete coverage. Then wrap a piece of white cardstock with white tissue paper and use tape to secure in the back. The shiny side of the tissue paper should be against the cardstock. 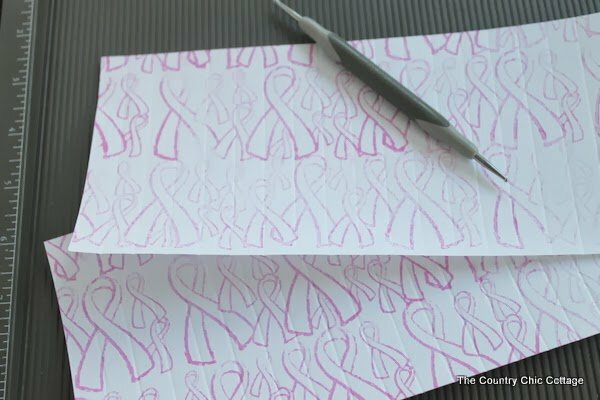 Then print the image of your choice onto the matte side of the tissue paper as shown below. 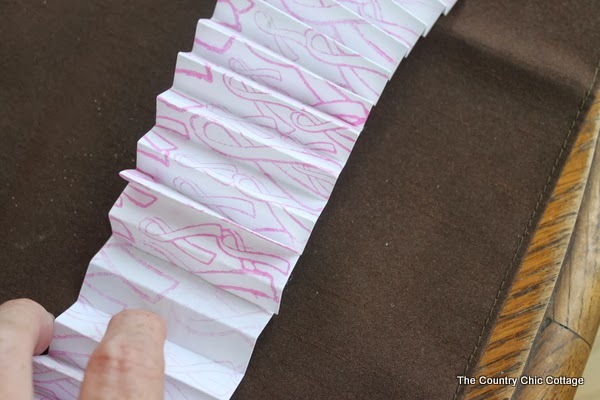 Remove the tissue paper from the cardstock. 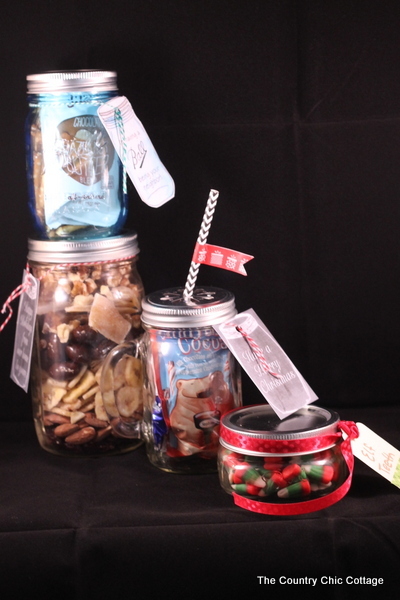 Trim around your image and decide where on your jar you would like it to be placed. 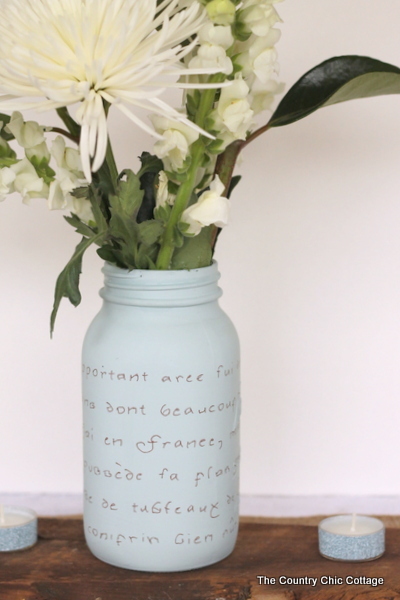 Use Americana Decoupage medium to adhere the image to your jar. Printing on tissue paper will make the image blend into the jar more. Just coat your image on the back with the decoupage medium. If you need to add any decoupage to the front, be sure to spray a matte sealer or hair spray over the tissue paper first to lock in the ink. 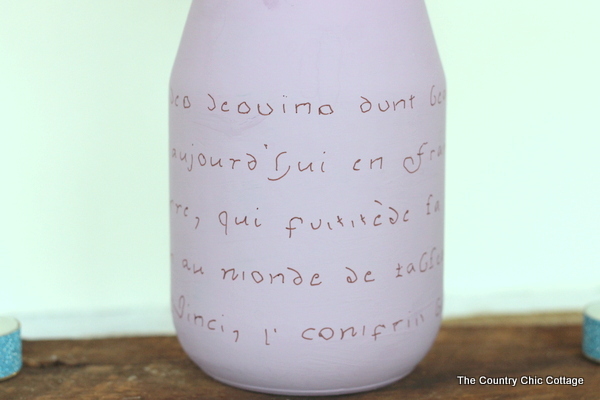 Once the decoupage dries completely, you can add a hand stamped tag to your jar as shown. What to put in your jar? Print enough of these fun free printable bookmarks for the class. This is a great gift for the teacher and classroom to celebrate the birthday of Dr. Seuss. 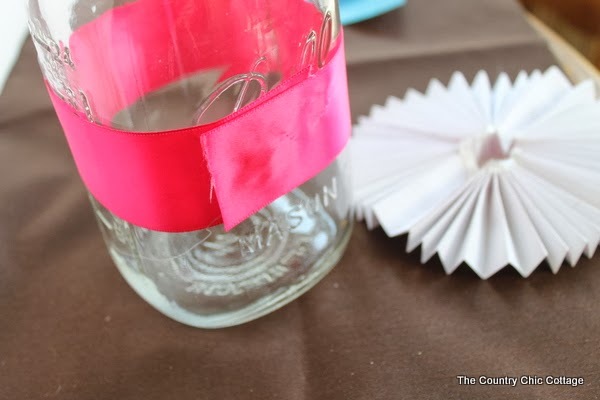 Just place the bookmarks inside the jar and add a lid. 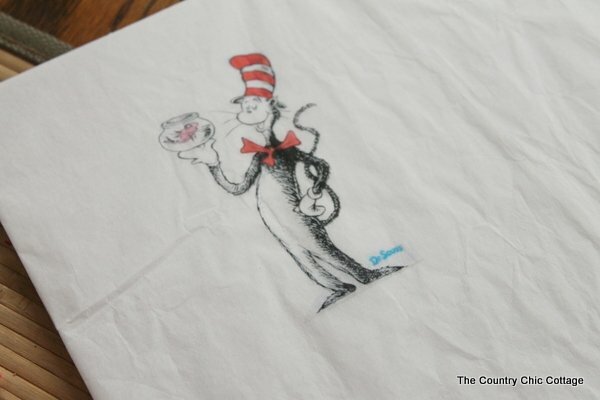 You can get even more Dr. Seuss inspiration on my Dr. Seuss Pinterest board. Plus stay tuned right here as we have two more days of Craft Lightning Seuss edition left and I have more fun in store for you. 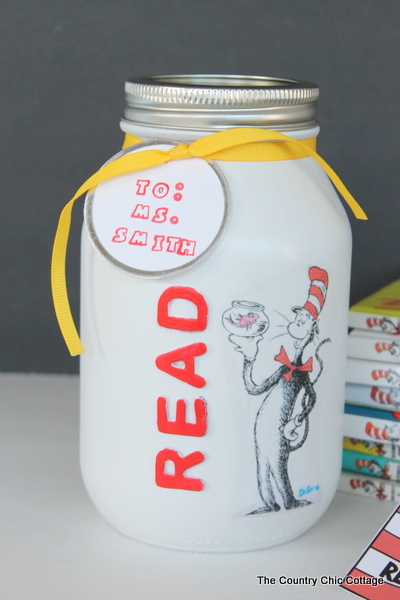 Be sure to make my Dr. Seuss gift in a jar for a special teacher in your life to celebrate Read Across America Day. 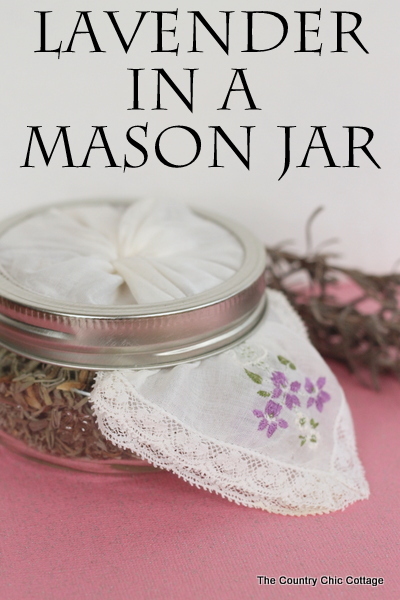 Add a gorgeous air freshener to any room by putting lavender in a mason jar. The idea for this started when Carolina from 30 Minute Crafts and myself made this video with 10 gifts in a jar. 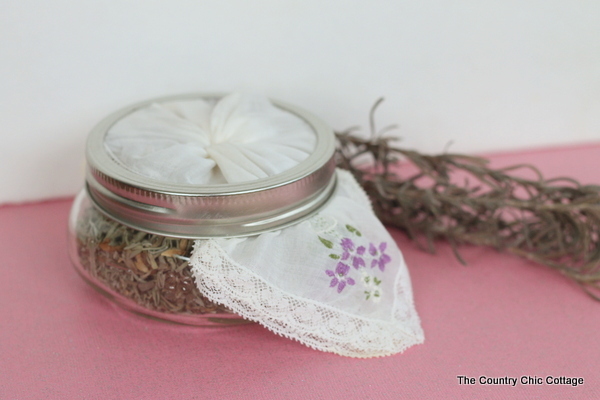 She added lavender to a jar in the video for a fun gift and I thought the idea was brilliant. I had tons of lavender in my flower garden so I was ready to go. 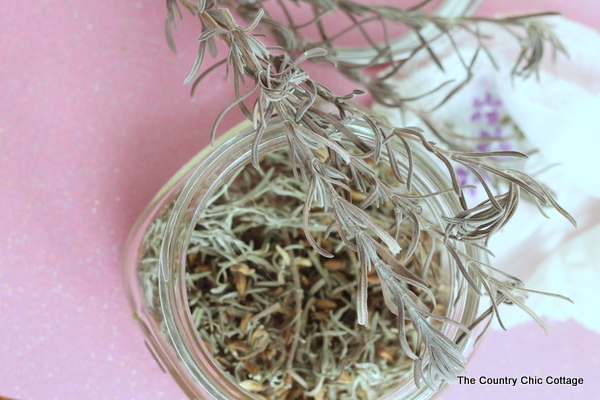 First I added the lavender to the jar by pulling it off of the stems. Carolina used just fabric on top of her jar but I wanted to be a little different. I had a vintage handkerchief in my stash so I grabbed it. I bundled it up and secured with a rubber band to make it the proper size to fit on my jar. 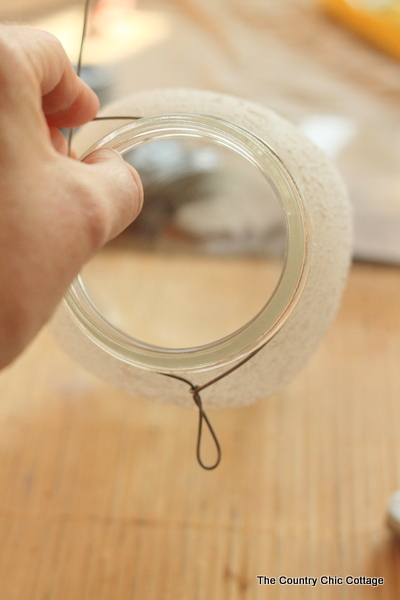 I then put it rubber band side down on the jar and added the band of the lid around it. I love that puckered look on the top as well. This lavender in a mason jar now resides in my bathroom where I can appreciate its amazing scent. I just shake the jar occasionally to stir up the smell. What do you use lavender for in your home? I have a ton more and need a way to use it y’all. I have some super fun solar mason jar lights for you today. These lights will be the perfect addition to your yard plus they are solar powered so no need to worry about running electricity. I made these winter themed but you can definitely change them up for the seasons easily. This project was originally posted over at Crafts Unleashed but I am republishing in case y’all missed it. The above products were provided to me as part of my design team status with Consumer Crafts however all projects and opinions are my own. Your solar light will come packaged as shown above. 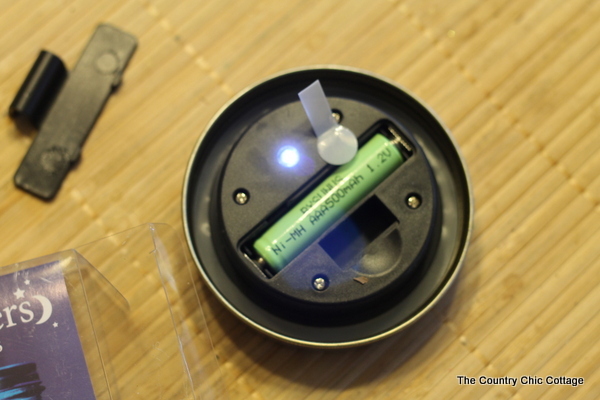 You will need to remove the pull tab for the light to work, and charge it for a few hours in the sun prior to use. 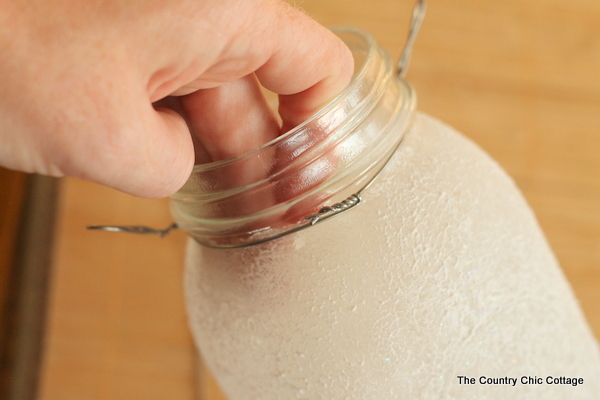 There are two winter versions of the solar mason jar lights that I am going to show you today. First up is one painted with a little glitter snow. 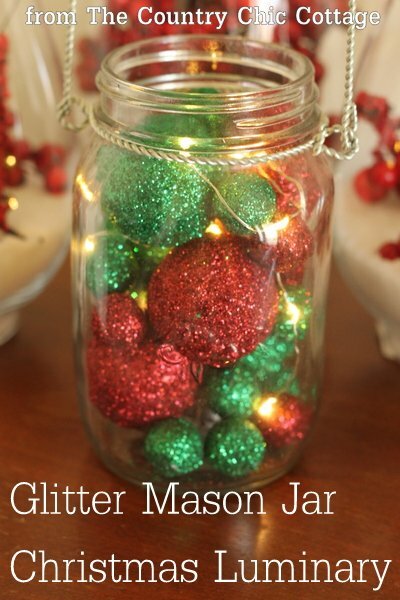 Use a foam pouncer brush and add glitter snow randomly to the jar. Allow to dry completely before continuing. 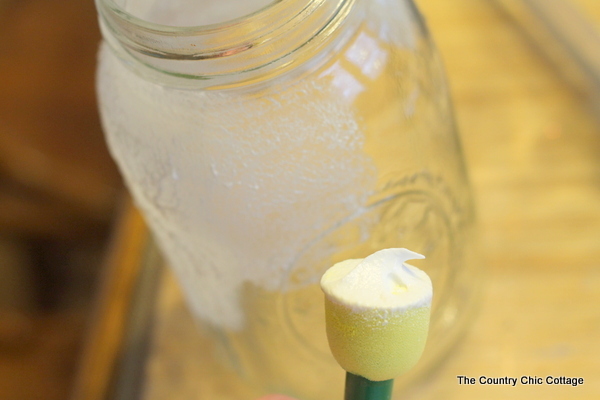 The second version just involves adding loose snow to the bottom of your jar. This is the non-permanent version that will be easy to change with the seasons. Because the light is in the top and does not get hot, adding items to the jar is fun and easy. Now lets make the jar into a hanging lantern. Grab your floral wire and some pliers. First, start with adding a loop with your pliers. Place the wire around your jar mouth and get the location for your second loop, which should be directly across from your first. 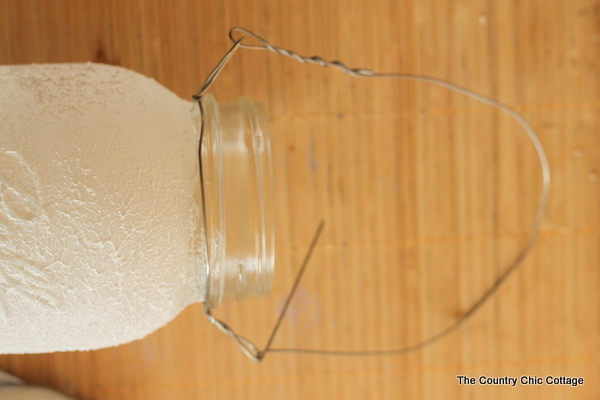 Place a second loop in your wire and then stretch it around the mouth of the jar. Use the pliers to secure, twisting very tightly. Cut off any excess and bend the twisted wire down to avoid injury. 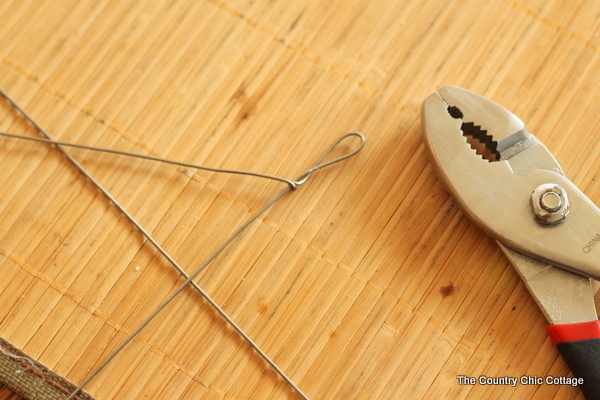 Use a second wire to create a handle by putting it through the loops and twisting to secure. You are ready to light up the night with your new solar mason jar lights. 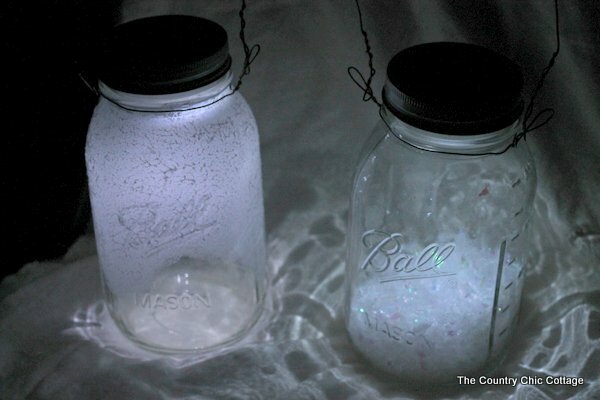 Look at the way the light sparkles from these great mason jar lanterns. 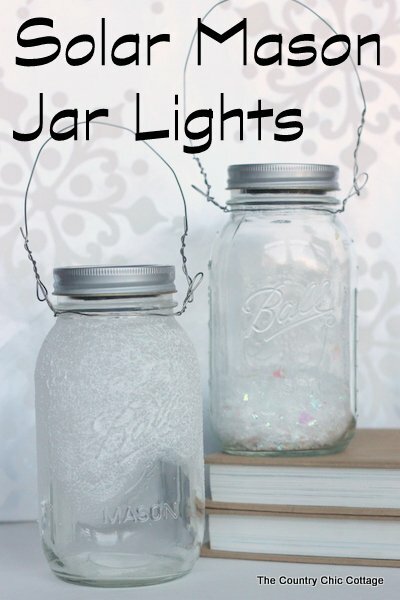 What items will you add to the inside of your solar mason jar lights? Snow? Or something less seasonal? 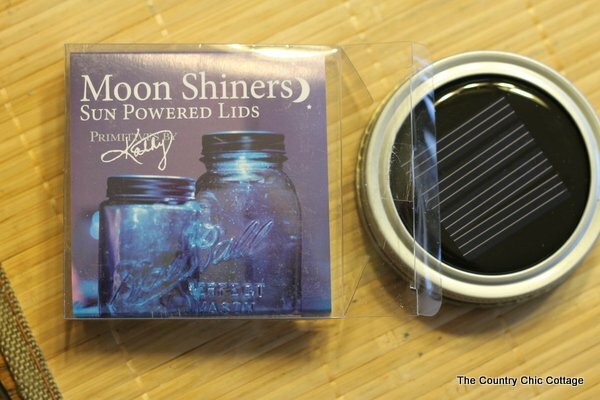 Just grab the lighted lids from Consumer Crafts and make your own version today. This post is done as a part of my design team status with Consumer Crafts however all opinions and projects are my own. These mason jar Valentines are perfect for anyone that you love this Valentine’s Day. 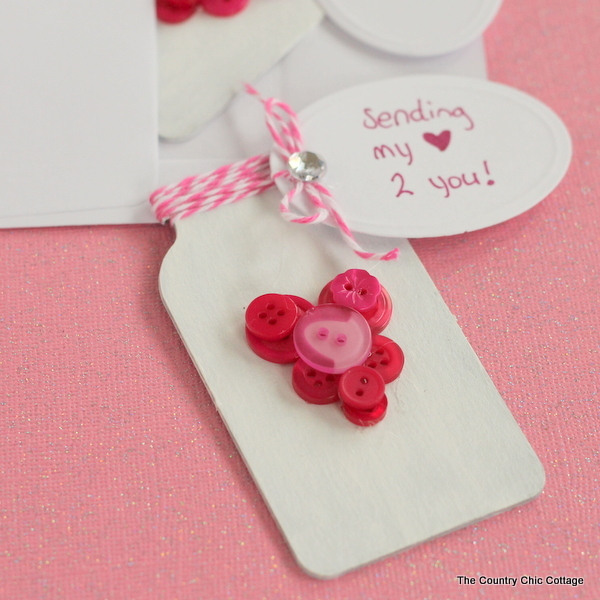 The button hearts are super simple to make but will show your sweetheart that you care. 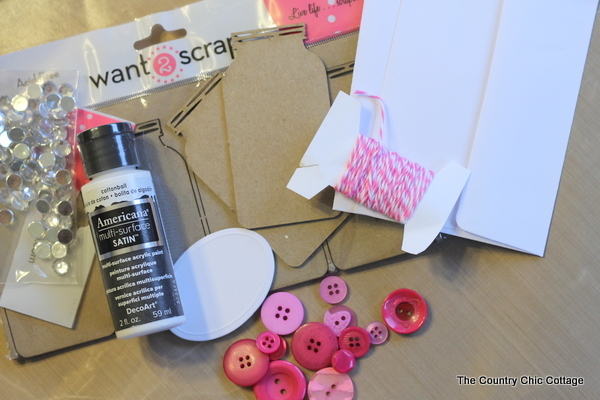 Send your heart in an envelope to anywhere in the world with this quick and easy Valentine’s Day craft idea. These were first published over at Buttons Galore and More as part of my design team status. Supplies were provided by them but all projects and opinions are my own. Portions of the below supplies were given to me as part of my design team status on various teams. All projects and opinions are my own however. 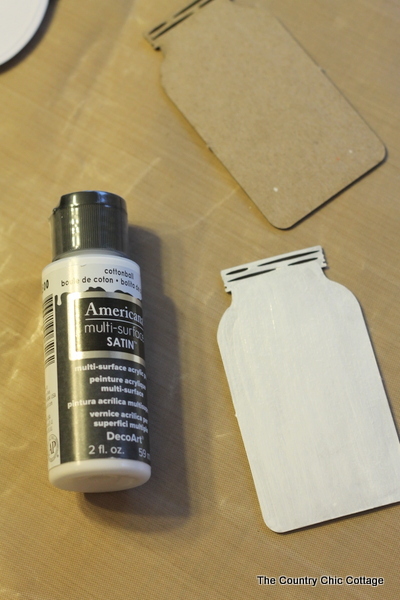 Paint both sides of the chipboard mason jar with 2 -3 light coats of paint. Allow to dry completely in between coats. 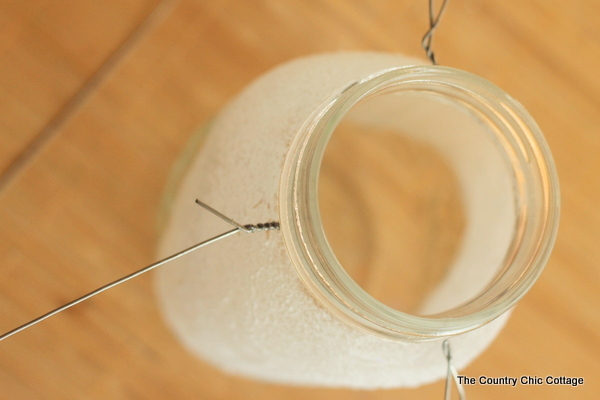 Allow your mason jar to dry completely. Then wrap the top with baker’s twine. Tie and leave your ends loose as shown below for now. Lay out a heart like shape with the buttons as shown below. Use hot glue to secure the buttons in place when you are happy with the placement. Add a second layer of buttons on top of the first as shown below. 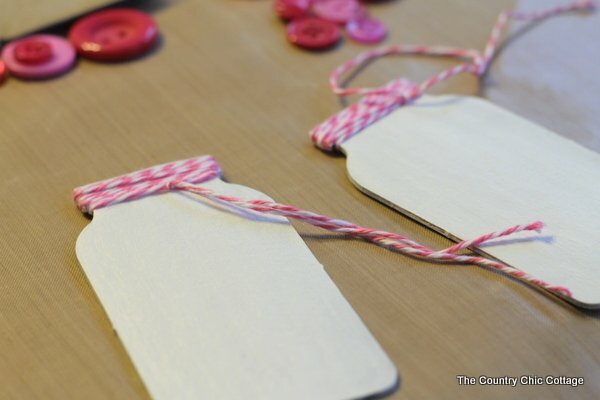 Write on your tag with the sharpie then punch a hole and tie into place with the twine. Add a rhinestone to the center of the bow as shown with hot glue. Trim away any excess baker’s twine with scissors. 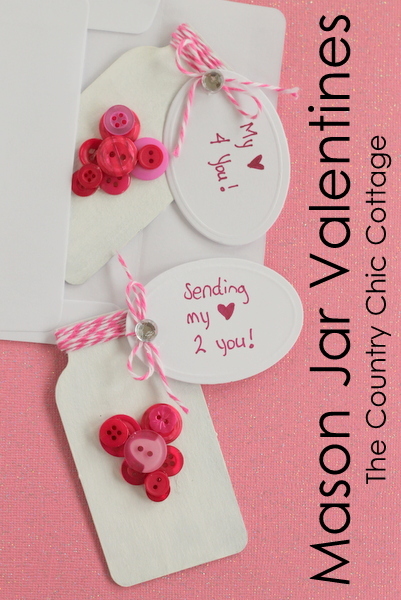 Add this mason jar valentine to an envelope if desired for a perfect gift to anyone your love for Valentine’s Day. Will you give mason jar Valentines to your sweetheart this year? Grab the supplies and get started today. Yesterday I shared my embroidery hoop art make and take from CHA and today I am going to share a display project I had at CHA. You can see my full CHA recap here if you are interested in what the show is all about. My decoupage mason jar canvas art was displayed at the DecoArt booth during the show. I was asked to use their new Americana Decoupage line to make a canvas. This is what I came up with. Y’all knew it was going to be jars right? I started with various paper and embellishments from the American Crafts Mayberry line. I used the decoupage medium to put a large piece of scrap book paper on the entire canvas. You can see my technique for adding paper to a canvas on this post. I use a rubber band to hold the edges in place while the entire thing dries. Once dry you can trim the corners and edges as shown in the picture below. I cut a mason jar with my Silhouette from pink paper and added that on top with decoupage. I then played with more embellishments until I had something I loved. 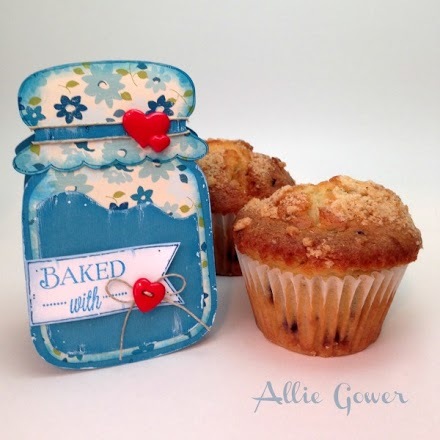 Everything was added using the Americana Decoupage Medium even the baker’s twine. Allow your project to dry completely before moving. Who says you need to paint to make your own art? You can use decoupage and some scrap book embellishments to make fun art for your own home. 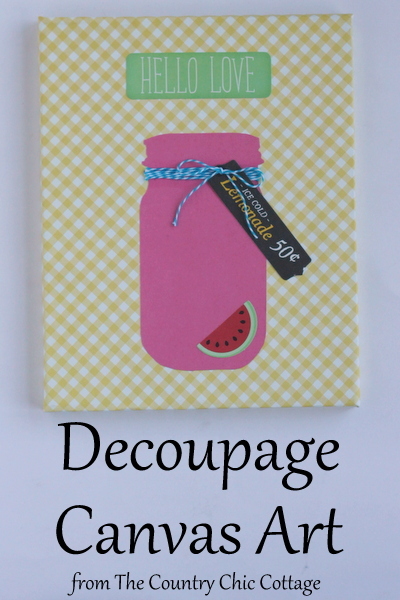 Get inspiration from my decoupage mason jar canvas art and start your own decoupage canvas today. I am continuing with cleaning and organizing week today and showing y’all my way of organizing buttons with mason jars. 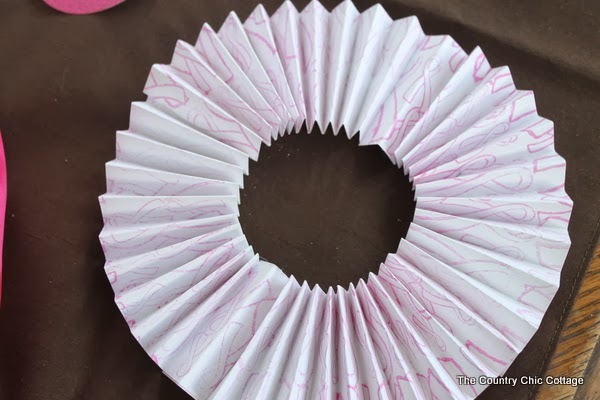 You could use this method to organize any small craft supplies or household items. Grab some of the new blue Ball heritage collection jars to get started. If you are looking for even more great cleaning and organizing tips this week, be sure to visit my partners for this series Always Expect Moore and The Shabby Creek Cottage. I started with a pile of buttons in a huge plastic tub. I could never find anything when looking. So I grabbed my jars and started sorting the buttons by color. I also have a ton of vintage buttons still on cards so I threw those in a large galvanized bucket. Once the buttons were sorted by color, I already felt better about my button “collection”. Okay I might just be a button hoarder. You be the judge. I then cut white card stock to the size of the mason jar lids. I stamped the colors in each jar on the top of the lid. I reserved two jars for my buttons from Buttons Galore and More. I am a member of their design team and love getting their colored and shaped buttons to add to my crafting stash. I will continue to keep those separate while I am a member of their team so I can easily find the buttons supplied by them. It is working better than my old method of hunt and find already. Organize any small objects by finding a basket and fitting in your jars. Stamp those lids once you have sorted to easily identify your contents. You will have a more organized home in no time flat. How do you use mason jars to organize? Be sure to check out Crafts with Jars where I will be rounding up tons of mason jar organizing ideas all month. For now I will enjoy my way of organizing buttons with mason jars. Y’all stay tuned for even more craft organizing posts right here this month as well. 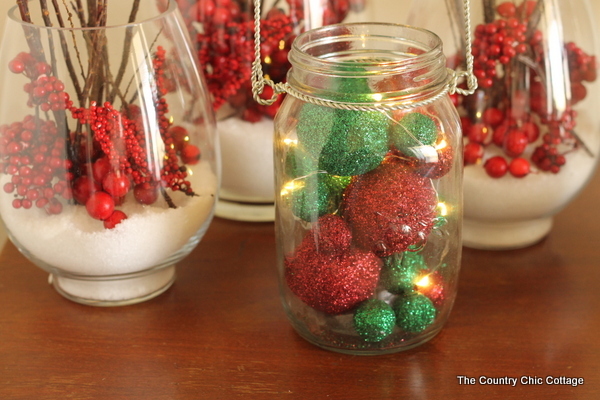 I have been having tons of fun with gifts in jars this holiday season. 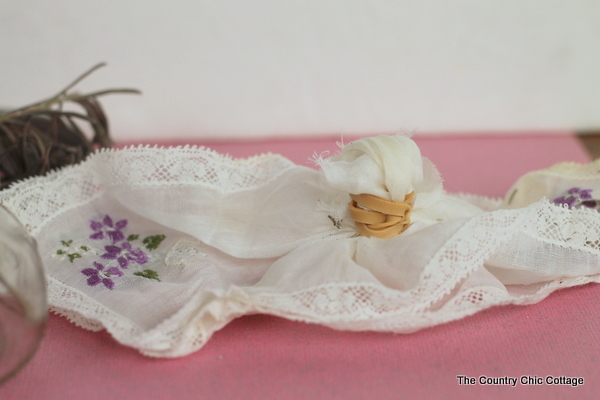 I have 10 MORE ideas for you that have never been seen before on The Country Chic Cottage. These are all super simple quick and easy gift ideas that can be completed in minutes. In fact, Carolina with 30 Minute Crafts and myself do 10 gifts in a jar LIVE in a short 10 minute video. This is part of a fun last minute handmade gifts series over at Crafty Hangouts that you don’t want to miss. Hang out with Carolina and myself in the video below. You can see me make the four gifts in jars pictured above plus Carolina will give you six more quick and easy gift in a jar ideas. Grab your jars and give handmade this holiday season. Grab two people, 10 jars, and you can have 10 gifts in 10 minutes as well. I promised y’all a few links in the video. Be sure to print out my chalkboard mason jar gift tags or Ball mason jar gift tags for all of your gifts in a jar. Now for some close ups of my four gifts in case you can’t see them well in the video. First up is my elf teeth in a jar. This one is a fun gag type gift for Christmas. 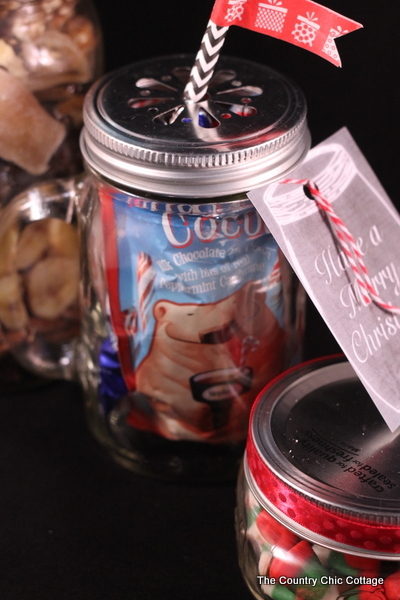 My spin on hot chocolate in a jar is packed full of fun and given in a mason jar mug. 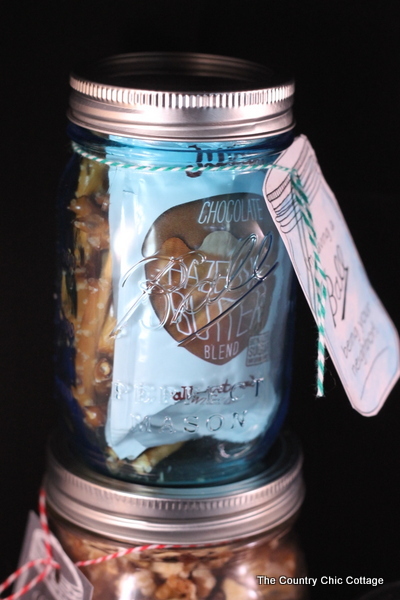 Give anyone on your list this fun nut butter and pretzel gift in jar. 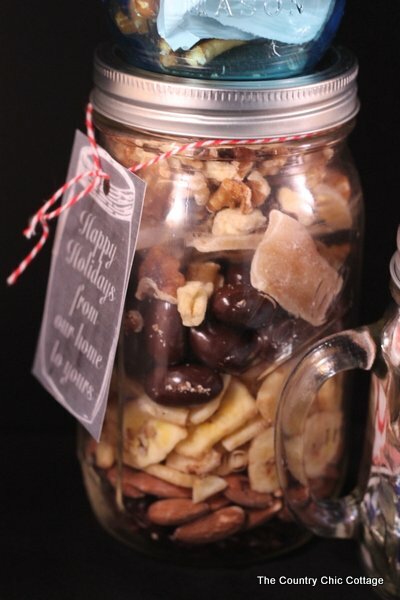 Layer up dried fruit and nuts in a jar for a pretty gift that only takes a couple of minutes to pull together. Love these? If you want even MORE ideas, be sure to watch the video above and get the other six ideas. With 10 ideas, there is a gift in a jar for everyone on your gift giving list. 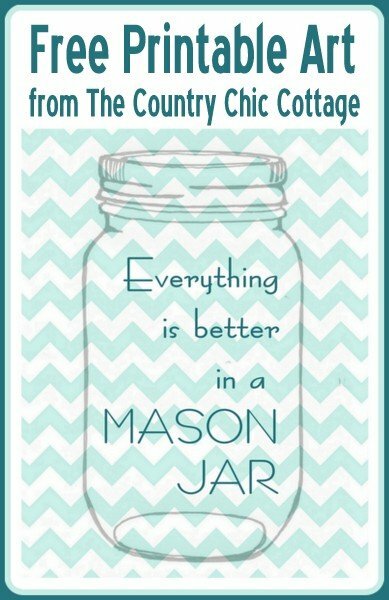 For the rest of the gifts in a jar from The Country Chic Cottage be sure to check out my 5 mason jar gift ideas plus the ultimate guide to gift in jars. If y’all need even more last minute gift ideas, be sure to follow along at Crafty Hangouts all week as the ladies over there rock the last minute gift videos! 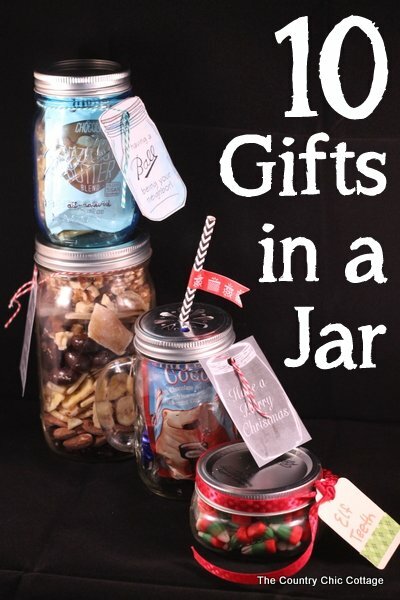 I hope y’all have enjoyed our 10 last minute gifts in jars and will use a few of these ideas for your loved ones. Time to get a little crafty with mason jars! Woo hoo! 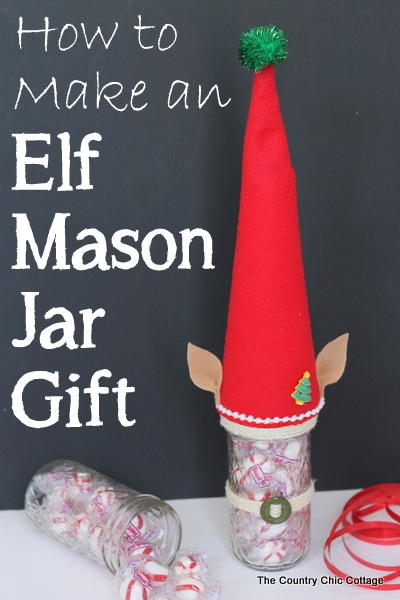 My elf mason jar gift for Christmas is perfect for anyone on your gift giving list. This one would also make a great hostess gift. 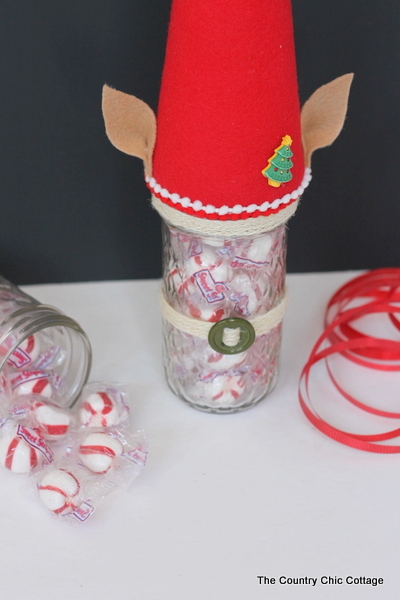 Make my cute elf jar in only a few minutes then fill it with the gift of your choice. 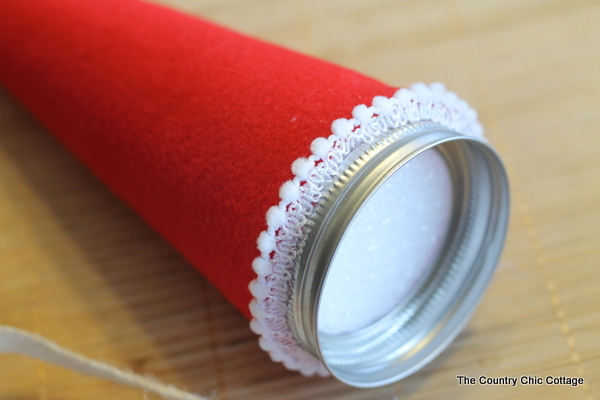 This jar only takes a few supplies and is super quick and easy. This post is also a blog hop with tons of great inspiration using buttons and ribbons together for some holiday crafts. Be sure to read to the bottom of this post for the links to all of their projects. 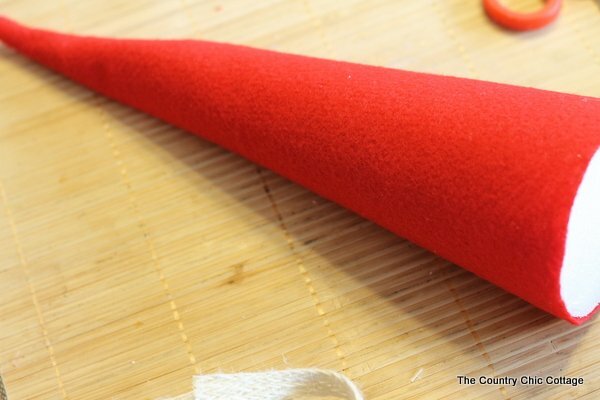 Wrap your cone with red felt. I had to play with the felt for a while to get complete coverage from one sheet but it is possible. Cut off any excess and use hot glue to secure. 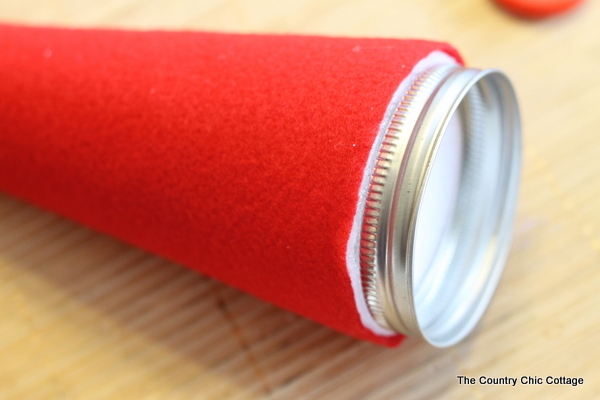 Use hot glue to add lid to bottom of foam cone. 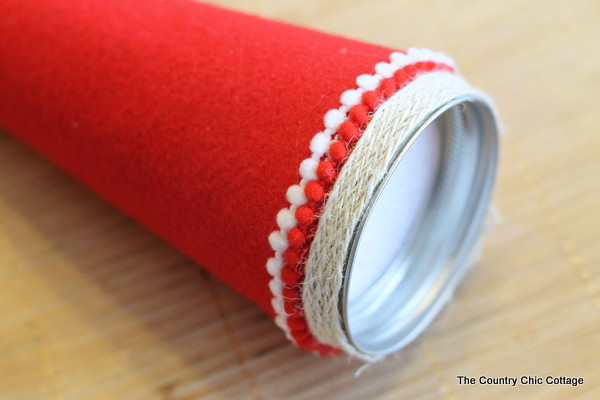 Start adding pom pom trim to the bottom of your felt covering up where the lid meets the felt. I then added a second row of pom pom fringe as well as the woven ribbon around the lid itself. 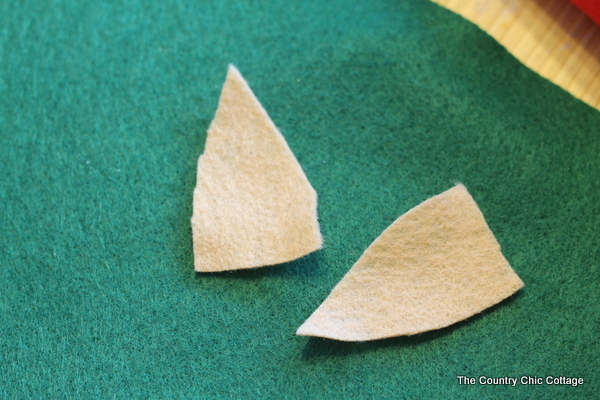 Cut tan felt to an “elf ear” like shape. 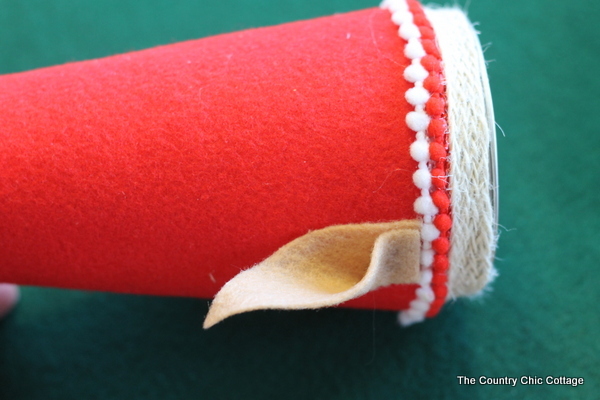 Fold ear and use hot glue to secure to both sides of cone. The variety pack of buttons from Buttons Galore and More have a wide variety of button shapes and sizes. There was a green one in my package that had two large holes. These were just right for threading through the ivory woven ribbon. Yep. It looks just like a belt buckle. I wrapped the entire thing around my jar and secured with hot glue. I also added a fun Christmas tree button to my elf’s hat. I liked just the one button sort of like a “pin” in his hat. 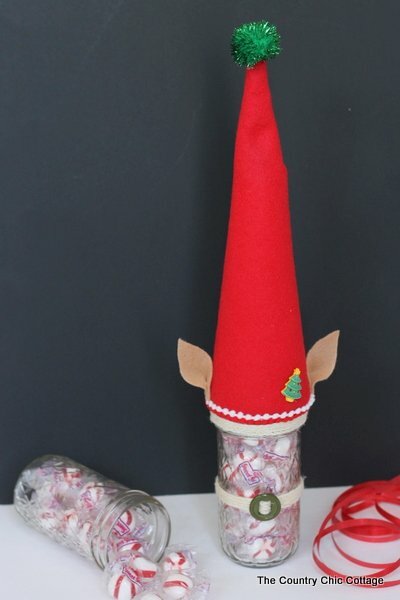 Who will you give your elf mason jar gift to? 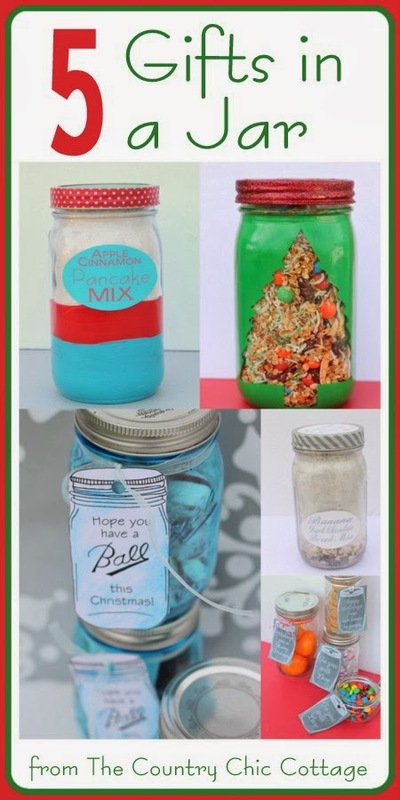 Make these quick and easy mason jar crafts for that hard to buy for person on your list. It is sure to put a smile on their face. Now for some more button and ribbon fun. Hop around to the blogs below and enjoy the holiday craft inspiration. 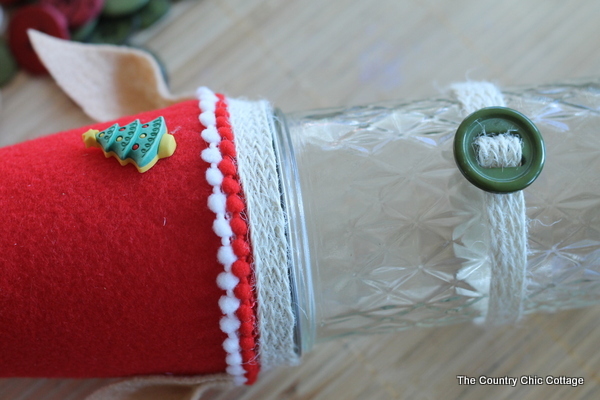 I hope you enjoyed this elf mason jar gift! 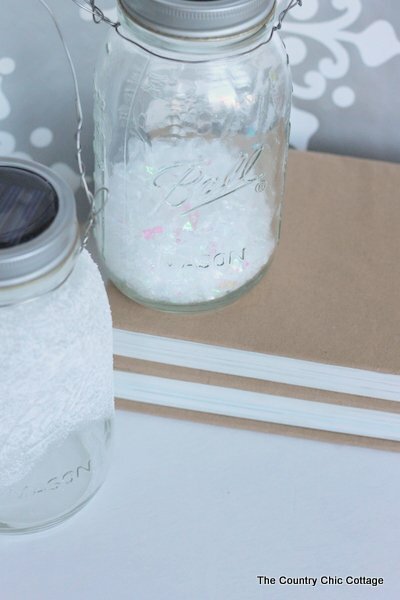 I have an awesome glowing glitter mason jar Christmas luminary craft for you today. This one is fun to make so grab the kids and lets get started. I was sent a mystery box from FloraCraft® Make It: Fun® Foam as part of their “Foam for the Holidays”. 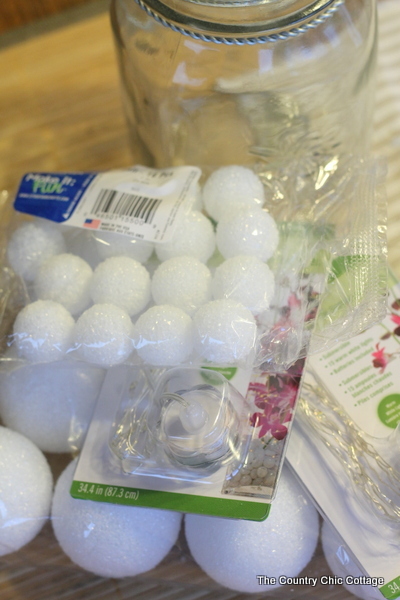 My box included Styrofoam balls in various sizes and various floral lights also made by FloraCraft®. I must admit that this odd combination had me stumped for a bit. But throw in a mason jar and anything is possible. 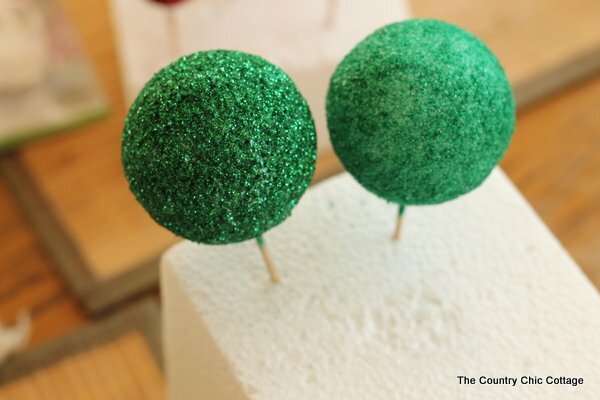 Start with your FloraCraft® Make It: Fun® Balls and Glamour Dust paint. I find that using a sponge brush makes painting Styrofoam so much easier. Apply a generous coat to all of your balls then allow to dry. I filled my container with the unpainted balls to see how many I would need for the finished product. A few more tips for painting is to use a toothpick to hold your balls like the picture above. This also makes this a project this kids can help with. I also save packaging material that comes with most electronics. It makes a perfect stand to hold your project while drying. Plus it is free….win win right? I gave mine over night to dry before continuing. 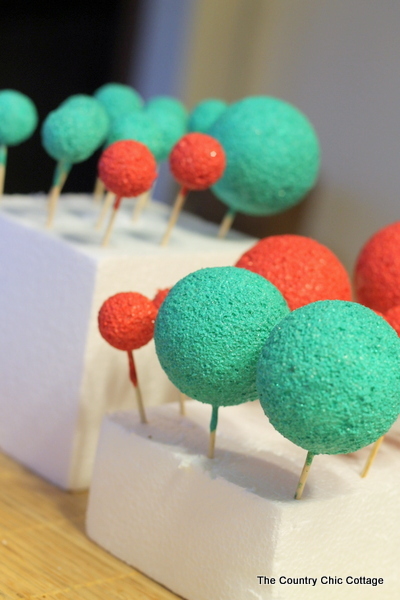 Next step is to apply decoupage medium to all of the balls and roll them in glitter. 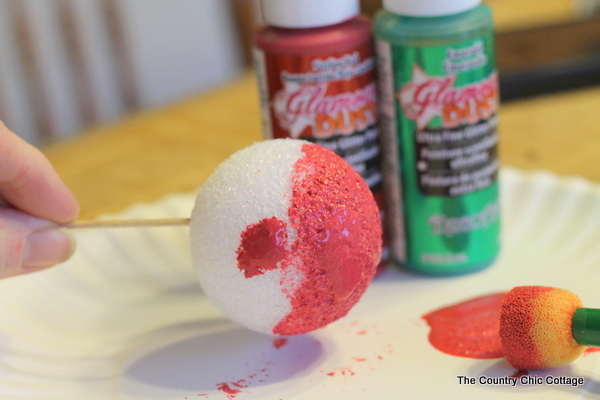 You can see below that the ball on the left has glitter applied while on the right only has the Glamour Dust paint. This step makes a huge difference. Don’t skip the paint step however because the white will show through your glitter and give your project an unfinished appearance. Again allow everything to dry completely. 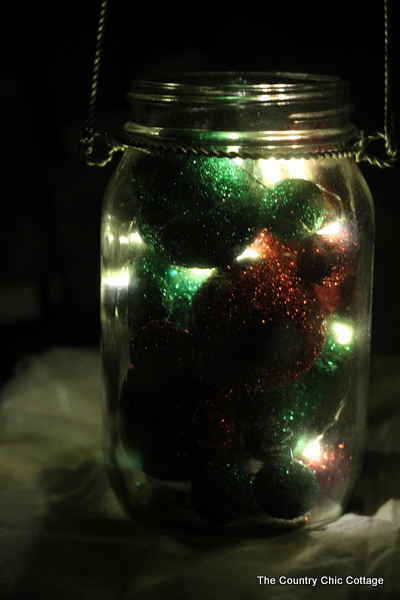 Then you can layer the balls into a jar while intertwining the Design It:® LED Light Strand in the jar. Be sure to put the switch for your light strand at the TOP so you can easily switch it on and off. I learned that lesson the hard way y’all. Now for a picture with the lights off so you can see the full effect. The LED lights do not get hot so this is the perfect way to use them. 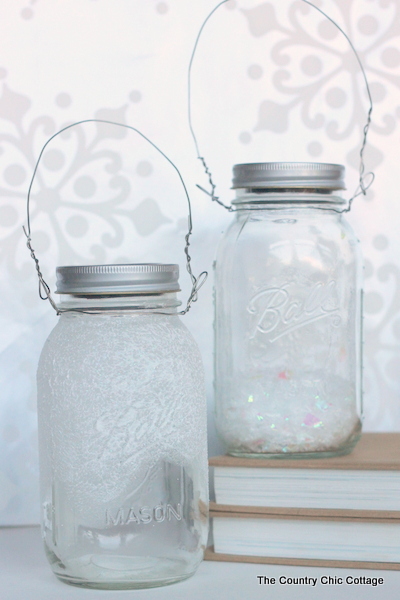 Make your own glitter mason jar Christmas luminary this year. Or make an entire set of them to display or for a centerpiece at your holiday table. Don’t you just love glitter? For even more ideas and inspiration be sure to visit the Crafts ‘n Coffee blog. A huge thank you to FloraCraft for partnering with me on this post. All projects and opinions are my own however. 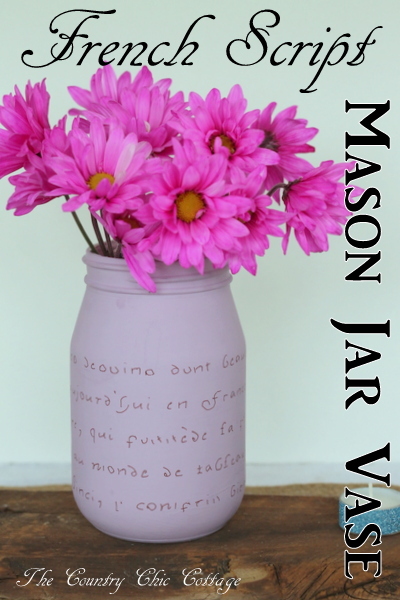 I have been busy this year creating gifts in a jar and thought I would share my 5 mason jar gifts all in one place for you today. If you aren’t Black Friday shopping, you might want to whip up a few of these gifts for family and friends right from your own home. Plus I have details on an amazing contest sponsored by Ball brand that you don’t want to miss. 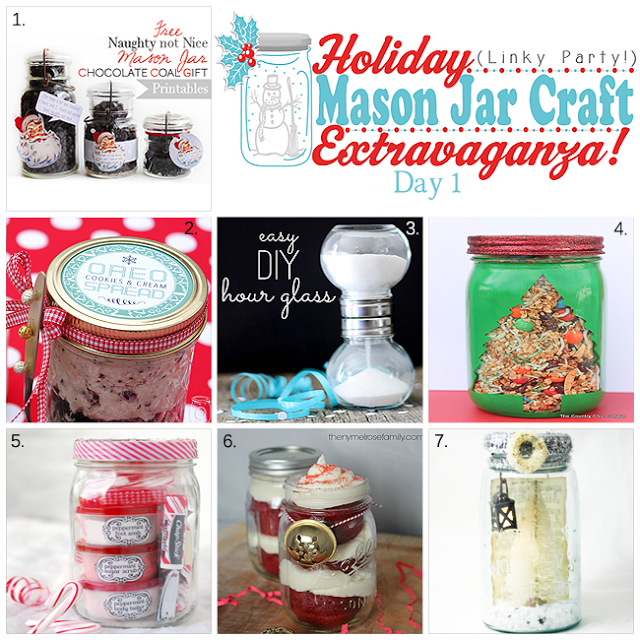 They are kind enough to sponsor this post on mason jar gifts today. So y’all enjoy the gifts in a jar below and be sure to read the contest details at the bottom of this post. 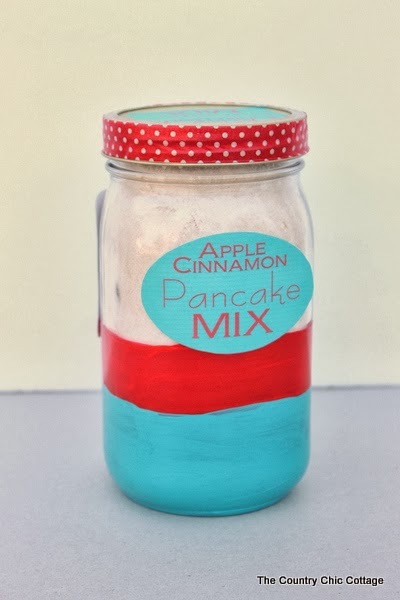 First up is my apple cinnamon pancake mix gift in a jar. 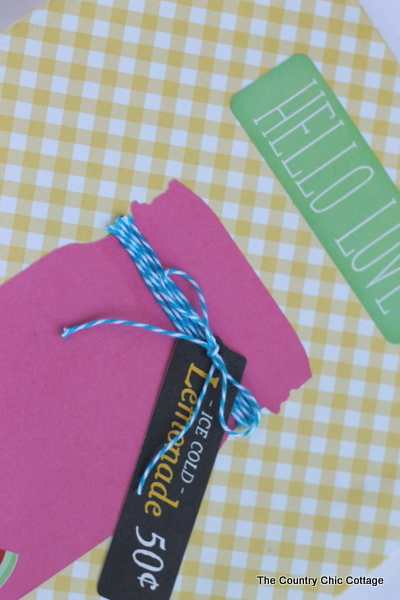 Not only do you get the recipe for the mix but also some fun free printables to add to the jar. Plus I painted the jar for a little extra gift once the mix is gone. I love adding a little something extra to my gifts in a jar. 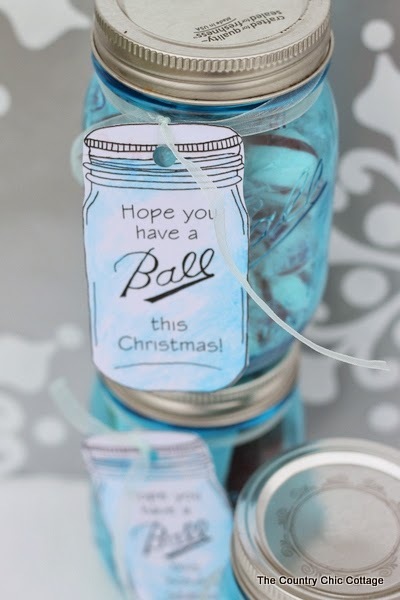 I have been getting tons of requests for more “Ball” labels for jar gifts and I answered in a BIG way. 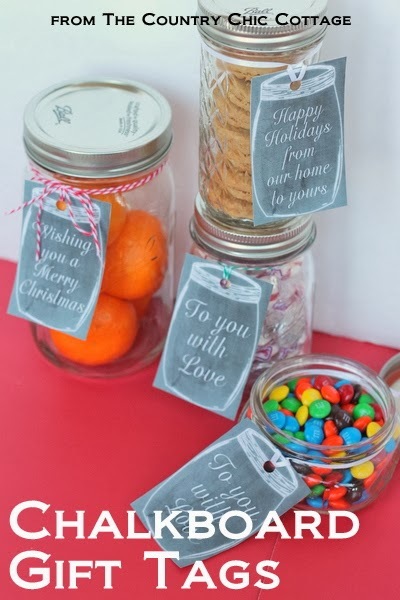 My Ball mason jar labels for gifts has something for everyone on your list. I have mom, dad, grandpa, your spouse, and many many more covered with tons of free printable labels. 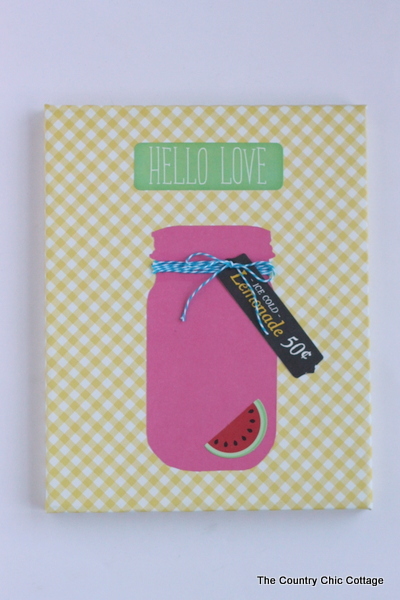 Add a gift to a jar then put on one of these fun labels for an instant gift that will put a smile on anyone’s face. 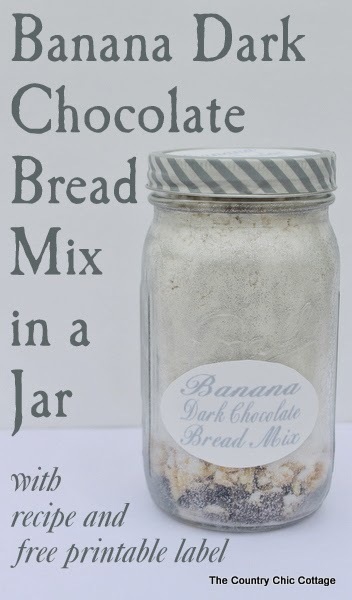 Next up is another mix but this time it is my banana dark chocolate bread mix in a jar. 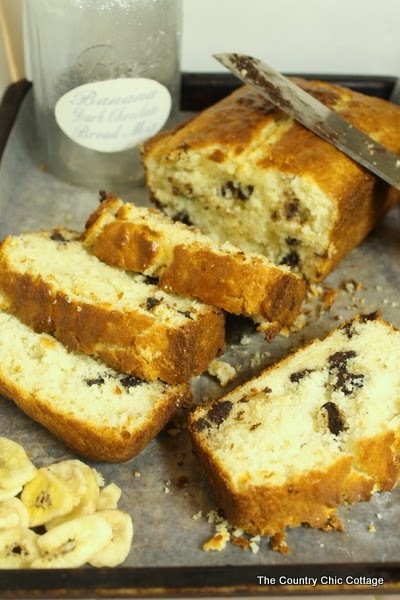 This bread is yummy y’all and your recipient can bake up a loaf of their very own in no time. 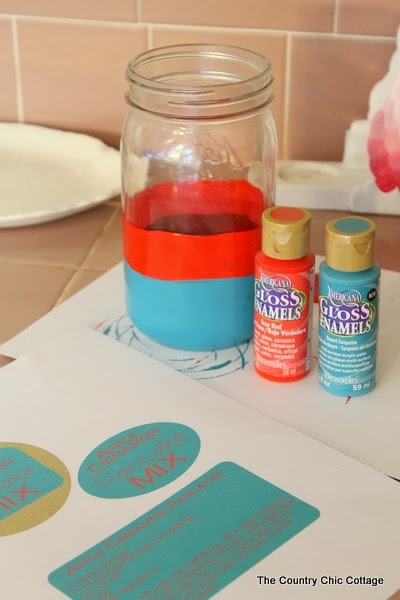 Get the recipe, free printables, and a fun way to paint the jar all in one post. Who says a gift in a jar has to be unhealthy? 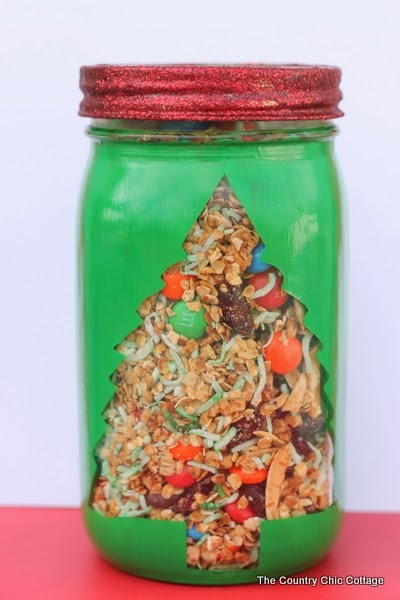 Gift my coconut almond granola gift in a jar for a healthy alternative. 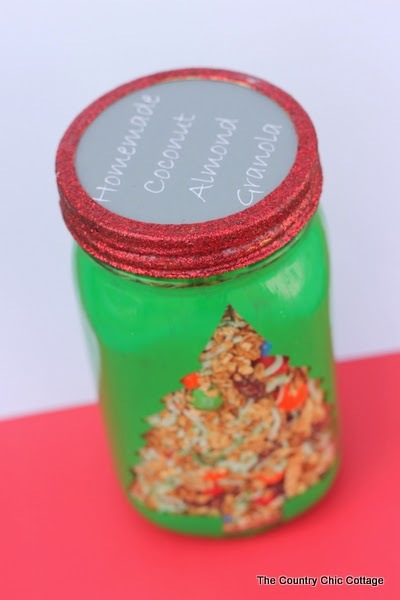 I share the recipe, free printable label, and of course how to pain that fabulous tree on your gift jar. You could use the painting method and put a different gift inside as well. Last but certainly not least is one you may not have seen yet. 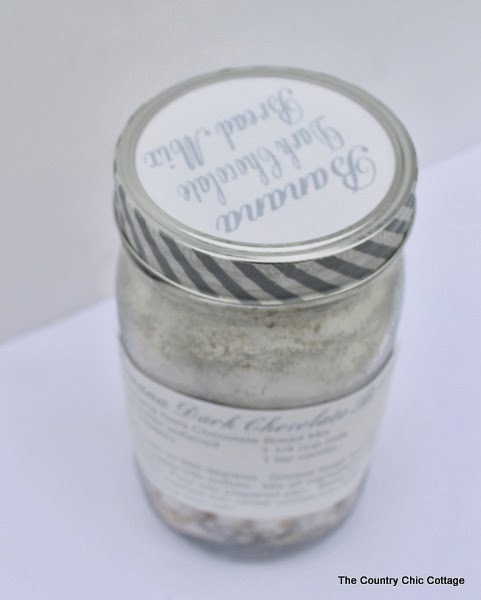 I posted some free printable mason jar chalkboard labels over at Crafts with Jars. I added those to some jars for gifts in the picture below to give you an idea on how to use them. I love these free printable tags and I know you will too. I hope you enjoyed all of these fun mason jar gifts. What will you be giving in jars this year? Oh I promised y’all a Ball brand contest didn’t I? Well here ya go! 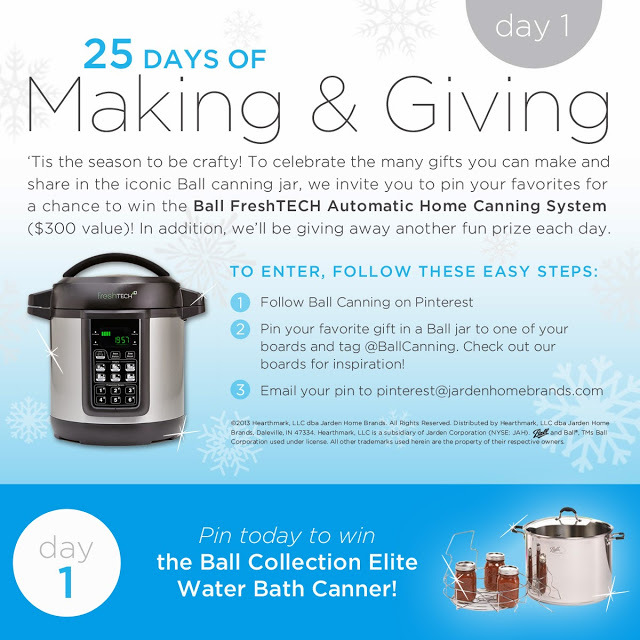 Get to pinning your favorite gift in a jar today to win some great prizes. Be sure to follow Ball on Pinterest and tag them when you pin. Please read the official rules if you have any questions. And yep you can pin your favorite gift in a jar from this very post. Good luck y’all! It is our final day of Craft Lightning and I saved my super quick and easy Ball mason jar labels for last. Ever since I posted my mason jar labels for teachers I have been getting requests for different versions. So y’all hold onto your hats cause I have mason jar labels for everyone in your family and life all in one post. 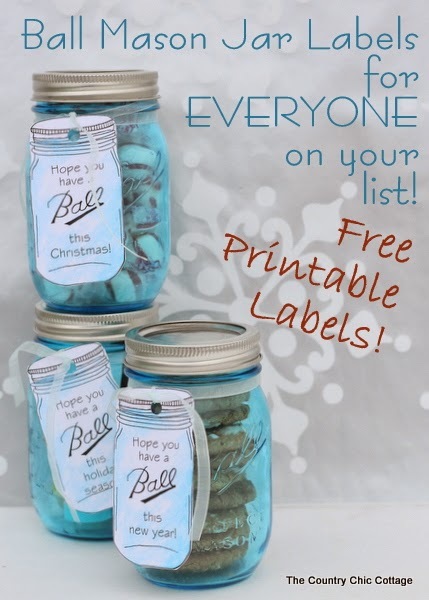 You can print these great labels for free and give gifts in mason jars all year long. Before we get started, be sure to catch up with Craft Lightning with the round ups from day 1, day 2, day 3, day 4, and day 5 in case you missed any of the fun. First before we get started, for those that need them you can buy your Ball Jar Heritage Collection Pint Jars from Amazon (affiliate link). Fill your jars with a gift — any gift — you can do cookies, candy, lotions, just anything! 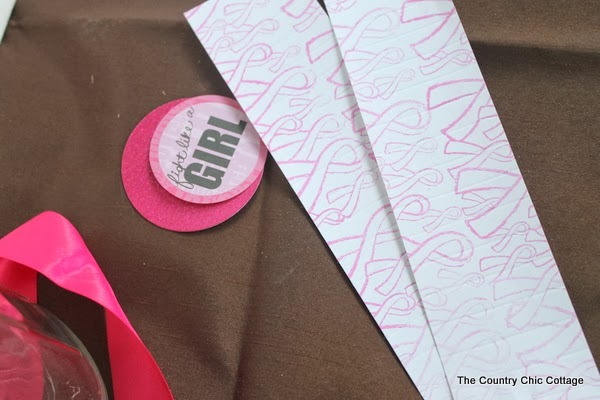 Then print our fun tags onto card stock, cut out, punch a hole, and tie on with ribbon. Quickest (and cutest) gift ever! Alright y’all pick a link below to print a set of labels. Print as many as you would like and enjoy! Did I miss someone on your list? Gosh I hope not! But if so leave me a comment and I will try to get some more versions up. Such a quick and easy gift idea yet they are adorable! Perfect for anyone on your gift giving list. Which labels will you be printing? 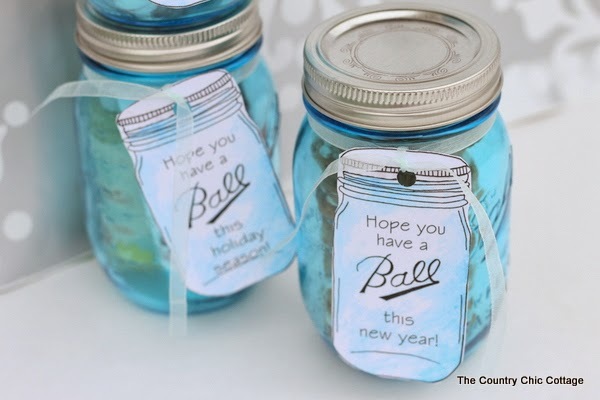 Stock up on those blue Ball jars to make the gifts really shine. Stay tuned as I am wrapping up Craft Lightning this afternoon and tomorrow. 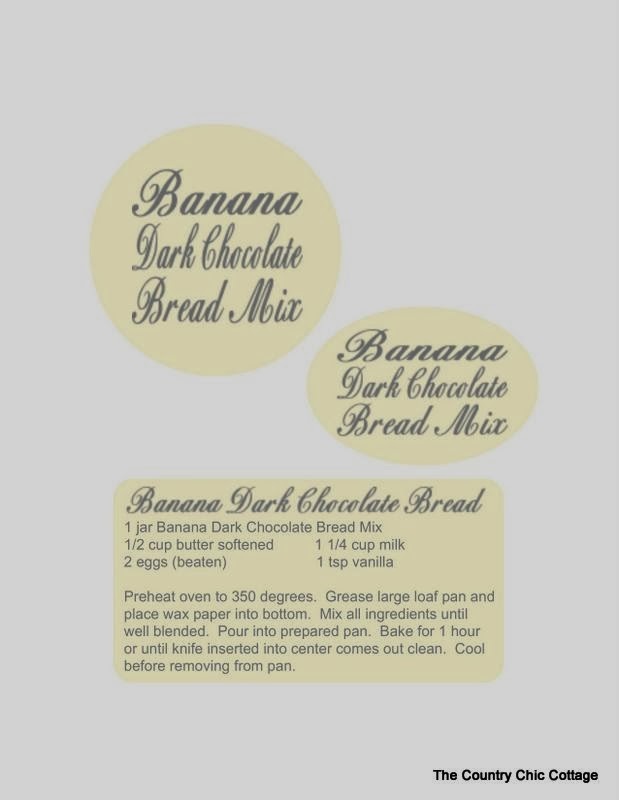 Y’all have been loving the gifts in a jar so I came up with a banana dark chocolate bread mix in a jar recipe that you will love. Mix up the ingredients, drop them in a jar, add our free printable labels, and you have a gift worth giving to anyone on your holiday list. 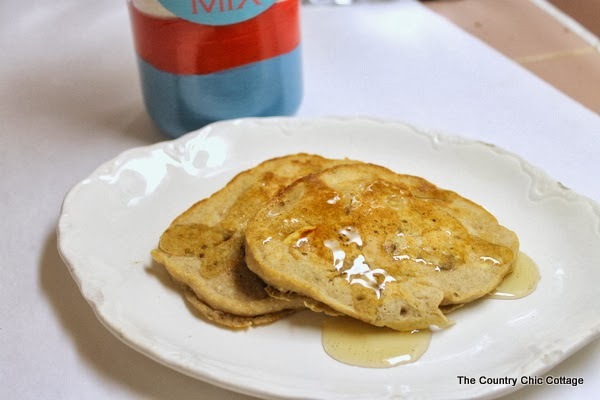 Don’t miss my apple cinnamon pancake mix in a jar recipe as well. I started by giving my jar a couple of coats of paint. I used Glamour Dust from DecoArt in silver. I like the jar to be a gift even after the mix is gone. This gives you a glittery container for your gift and an extra special home decor gift for your recipient as well. Layer your ingredients into your jar in the order shown. Pack each ingredient into your wide mouth canning jar as you go. Print our labels and glue those on. Full instructions for making the bread itself is on our printable labels. I have included a label for the top, front, and a label with the bread recipe as well. Click here to download your labels or click the image below. Now your gift recipient can mix up this super easy bread at their convenience. YUM! 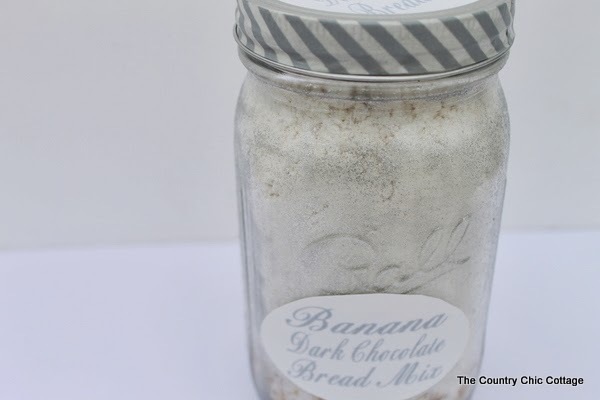 Who will you treat to a banana dark chocolate bread mix in a jar? Enjoy this quick and easy handmade gift idea. 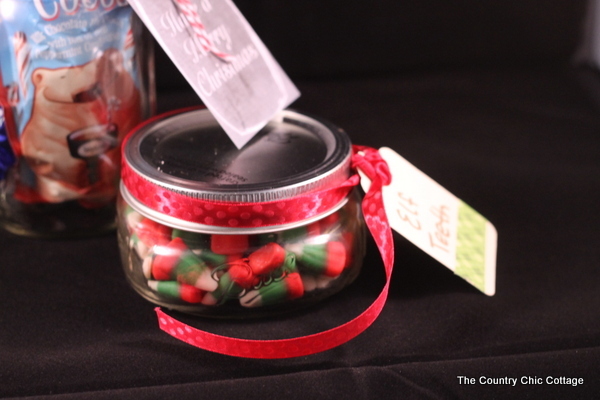 Y’all might have guessed that I would include some gifts in a jar in my handmade gift series. 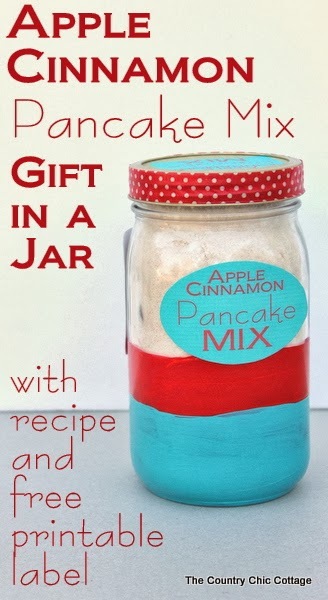 This Apple Cinnamon Pancake Mix Gift in a Jar is perfect for anyone on your Christmas gift giving list. 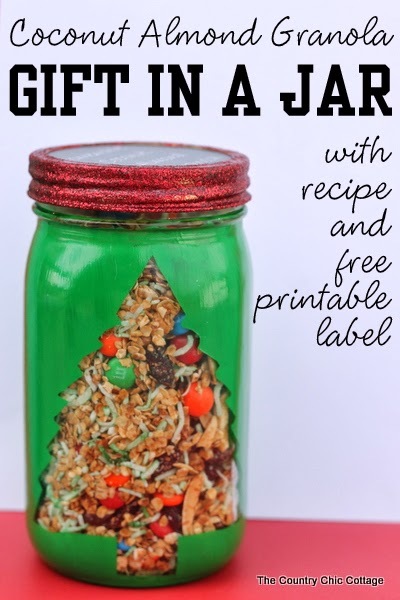 I have included the recipe and free printable labels below for you to create your own gift in a jar quickly and easily. I wanted my gift in a jar to be a gift well after the pancake mix was gone. So I did a little paint dipped technique on my jar before filling it with the mix. Just grab some DecoArt Gloss Enamels in true red and desert turquoise to match the printable labels. 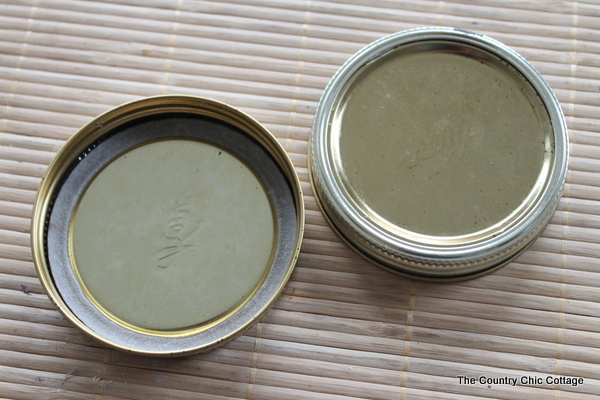 Paint a few coats on the outside of the jar as shown below allowing to dry between coats. Oh and grab the free printable labels as well. Now lets fill that jar! Mix all of the ingredients together then add to a wide mouth quart sized mason jar. This is JUST enough mix to fill the jar to the top. 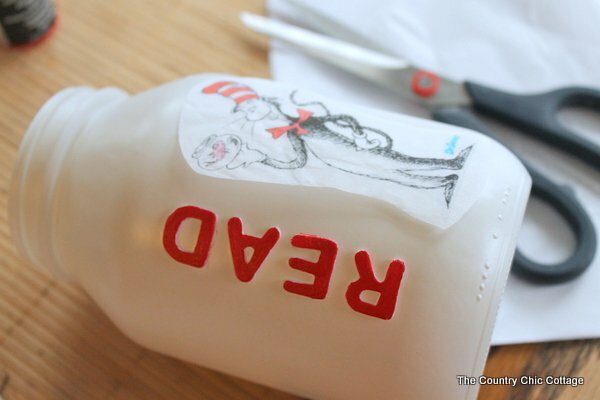 Attach the printable labels to your jar once it is filled. One label (that I put on the back) has the instructions for using the mix to make pancakes. NOTE PLEASE CLICK HERE TO GET THE LABELS AND ENTIRE RECIPE! Oh and yes….I did make some pancakes! The instructions serve 5 and use about 1/2 of the mix at a time. I prefer mine with a drizzle of syrup. YUM! I used glue dots to attach my labels so they would not be permanent and could be removed from the jar once the mix was finished. I used washi tape around the lid band to give it another pop of red. 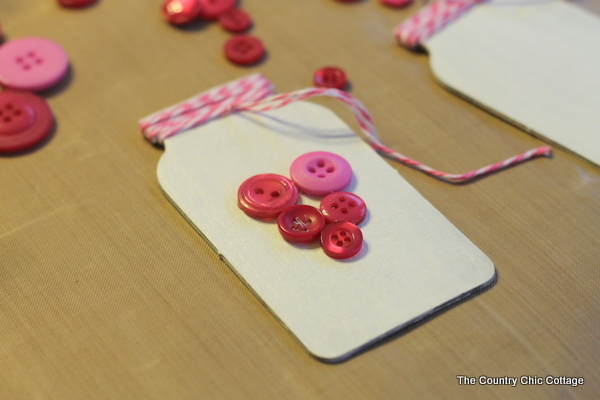 This handmade gift is super simple to make and will put a smile on your recipients face. 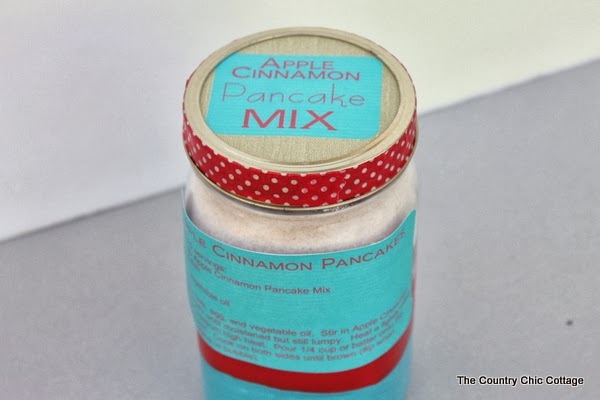 How many people will you treat to apple cinnamon pancake mix gift in a jar? Stay tuned for even more handmade gifts! 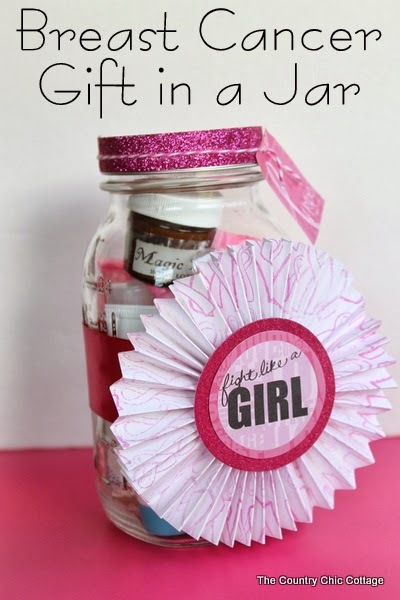 Breast Cancer Gift in a Jar plus a giveaway! I am joining up with an amazing group of bloggers today for Breast Cancer Awareness Month. 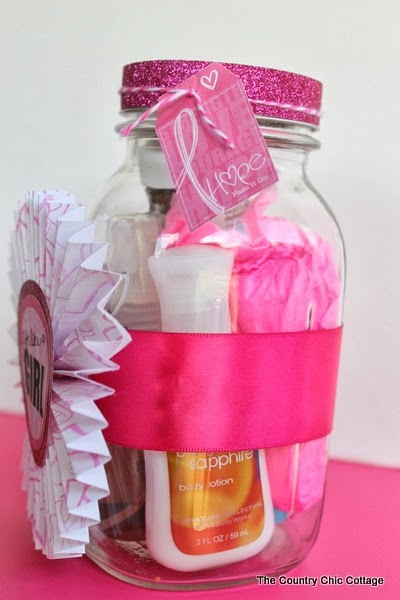 My contribution is this breast cancer gift in a jar. A perfect pampering package all wrapped up in a way that will make anyone smile. 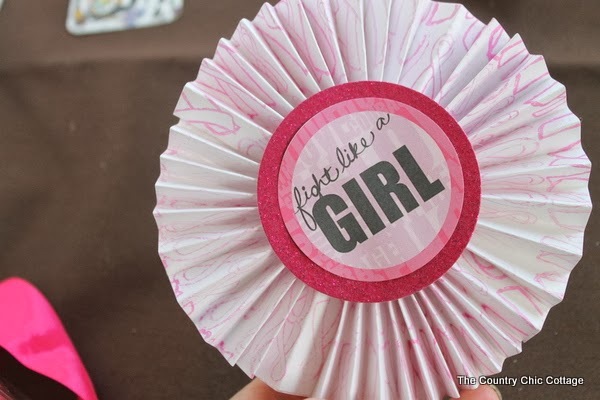 Learn how to make your own version with the instructions below and encourage someone to fight like a girl! Also don’t forget to enter the giveaway at the bottom of this post to win your own BCA craft supplies. 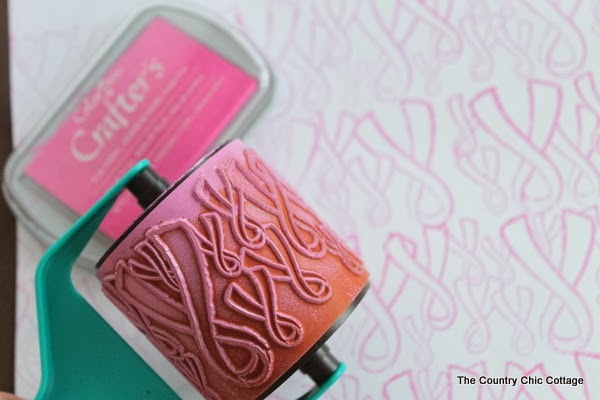 I started with the fabulous Rollagraph stamp and my pink ink. I used the stamp over an entire sheet of white cardstock. I just rolled the stamp on the ink pad then rolled it onto my paper. I then cut the paper into four equal pieces length wise and scored the paper every 1/2 inch using a scoring board. 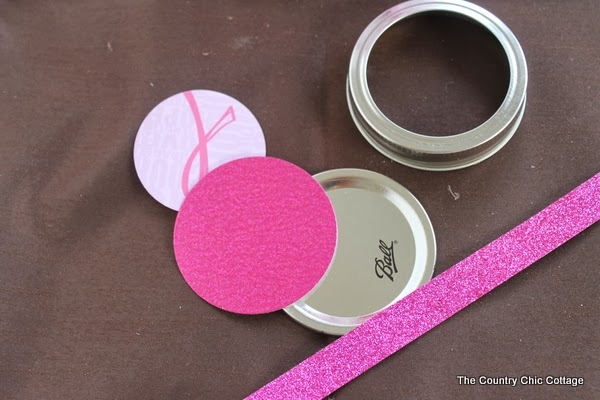 I cut circles from both the printables supplied by Jen and the pink glitter paper. Speaking of the printables by Jen, she has even more printables for BCA month for you so don’t miss those. I used my Sizzix to cut the circles but you can use any method you have available. Then fold your paper on each score line. Glue together the ends of the each of the four pieces of paper to make one long strip. Then glue together the ends of the long strip to make a circle. Apple hot glue to the center of the circle and pull in to make a medallion. Add the center pieces to the medallion to secure. Lets work on the lid for our jar now. Again I cut a circle out of the pink glitter paper and the printables from Jen. 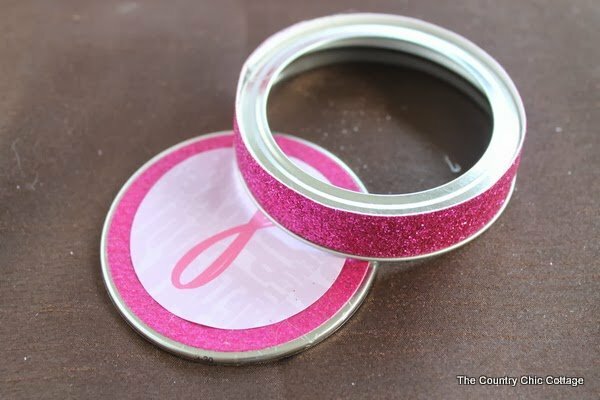 I used hot glue to secure those circles to the top and some pink glitter ribbon around the outside of the band. Now lets put this gift together. 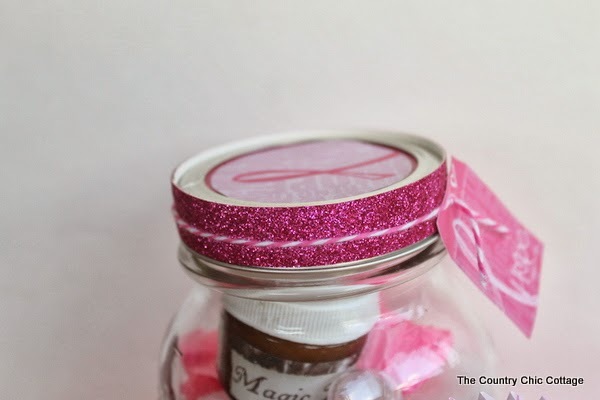 Start with a wide pink ribbon around the center of the jar and secure with hot glue. 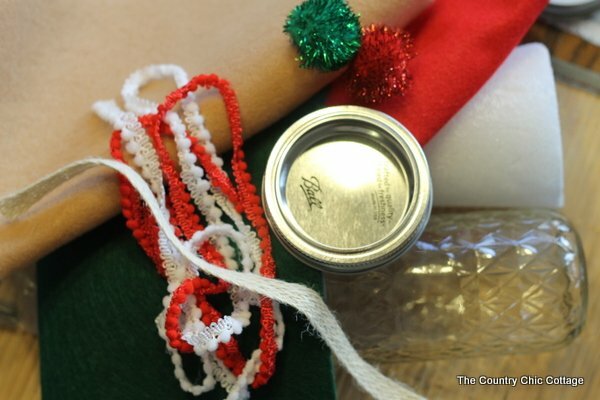 Attach your paper medallion to the front of your gift using hot glue. Add some fabulous pampering supplies to the inside and use pink tissue paper to fill. You could also fill with candy or cookies if you know that the recipient will enjoy them. Add your lid to the top. I also used a piece of pink baker’s twine to add a printable tag from Jen to the top. You can write who your gift is to and from on this tag. Your gift is ready to put cheer in the heart of anyone dealing with breast cancer. 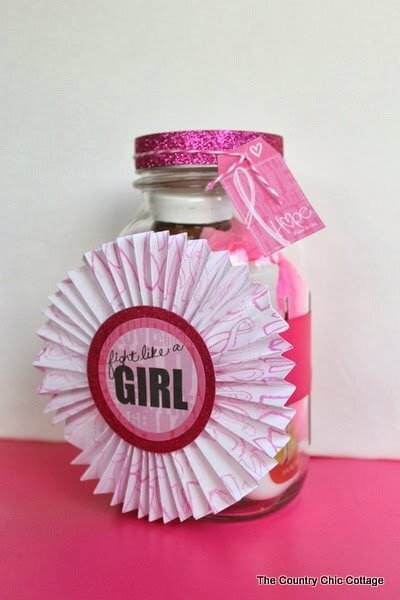 My breast cancer gift in a jar is a simple idea but a great way to encourage anyone to fight like a girl! 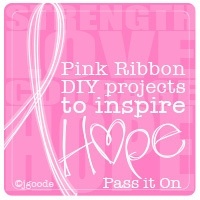 Please hop around and visit the other ladies that are crafting for Breast Cancer Awareness month this week. Their projects will be added below as they are published. 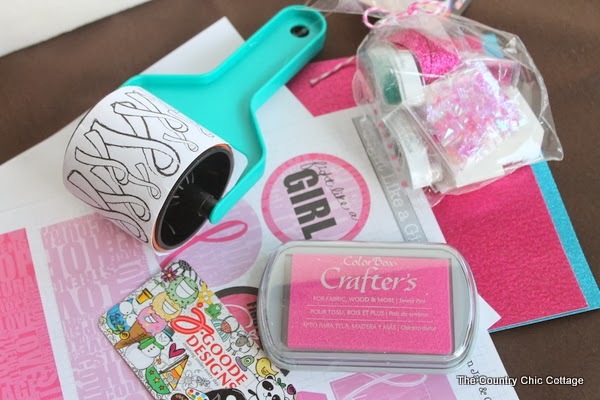 Enter to win a prize pack full of BCA crafting supplies below. Good luck! Please see the terms and conditions in the widget below. a Rafflecopter giveawayI was not compensated in any way for my participation in the event. I wanted to do something with JGoode Designs for BCA month. 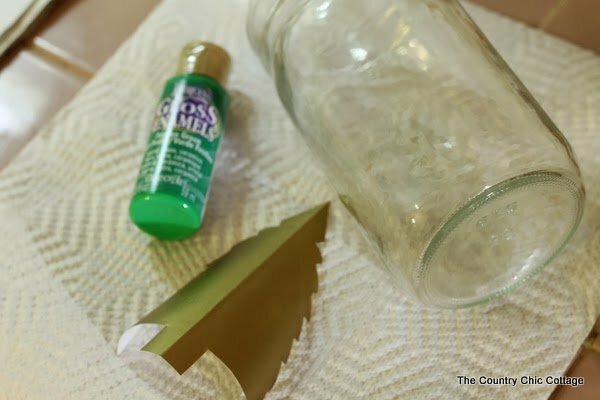 I am joining in with Crafty Hangouts this week and have a video on how to make my Halloween party favors in a mason jar. I am showing you how to make four different versions in a quick 13 minute video. 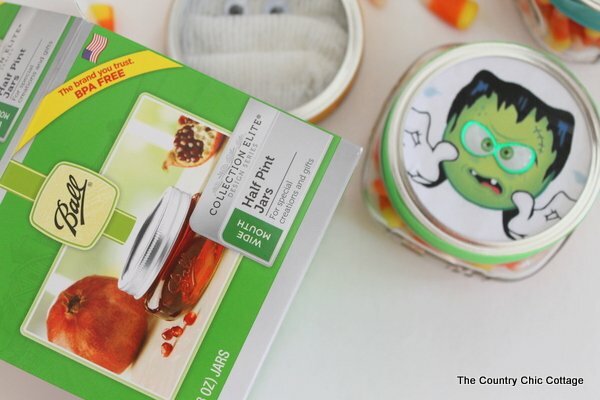 These Halloween party favors are perfect for your guests and super fun to make. I am offering up a free printable below for one of my versions so you can easily make your own favors quickly. Before you start the video, I am using these small half pint jars from Ball. They come in a four pack and are perfect for small favors like these. My printable mason jar toppers will also work with any other jar (wide or regular mouth) just trace and cut them to size. 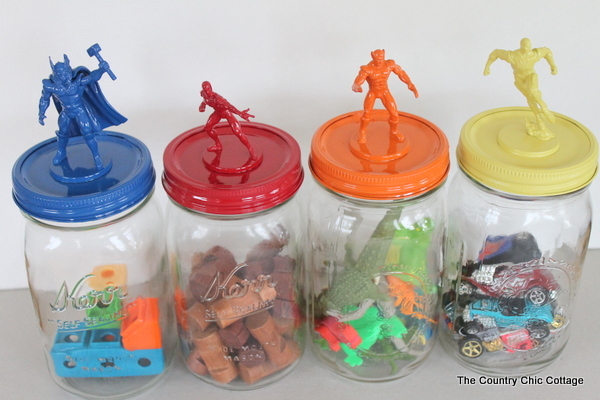 The other versions in the video will also work with any jars you have on hand. Now lets get crafty! I am crafting with Carolina from 30 Minute Crafts and she has a great spider mason jar craft for you as well. 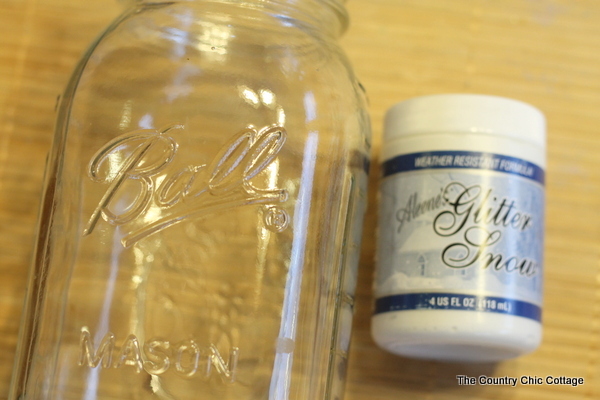 So head on over and watch us make two mason jar crafts in this 13 minute video. 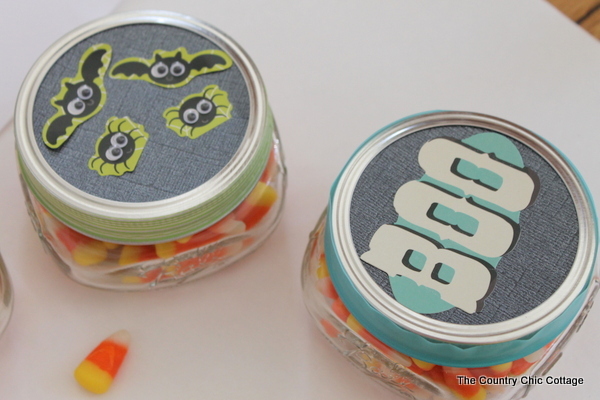 As promised here is a printable for four Halloween mason jar toppers to use for your party favors. Click on the image and it will open up in another window. Download then print them out. Here is some close up shots of the Halloween party favors in a mason jar that I made in the video. 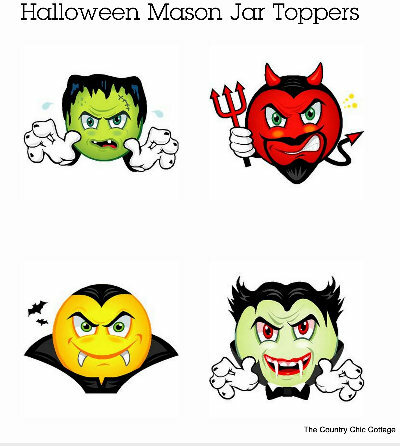 The two versions below just use scrapbook paper cut in a circle and a variety of Halloween stickers. You can find some cute Halloween stickers right? 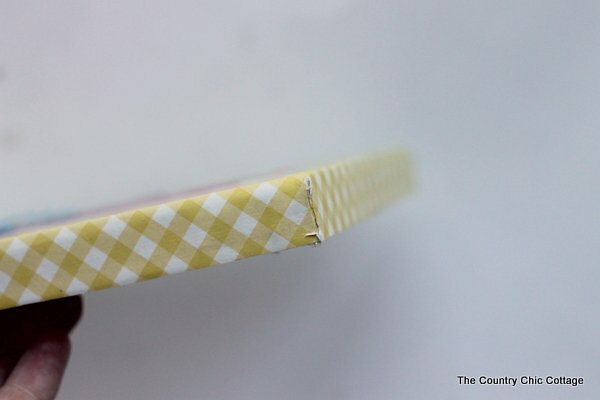 Be sure to wrap the edge of your lid in washi tape to finish off your favors. The other two versions include my mummy made with gauze from the medicine cabinet and google eyes. Then the version with my printable. I added some eye stickers to my printable to give the lid some dimension but this is optional. Be sure to follow along with Crafty Hangouts all week as there will be super spooky Halloween videos from +Carolina Moore , +Rhonda Greene , +Cyn Gagen and +Colleen Jorgensen . You don’t want to miss any of them! 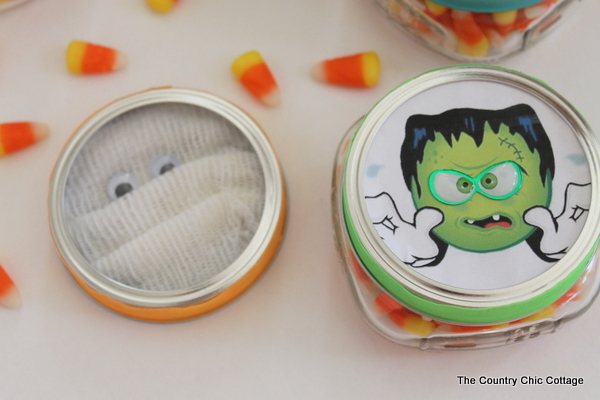 Enjoy my Halloween party favors in a mason jar at your super spooky bash. I had the opportunity to preview the new Super Buddies movie from the creators of Disney Buddies. You can own your own copy on Blu-Ray combo pack August 27th. 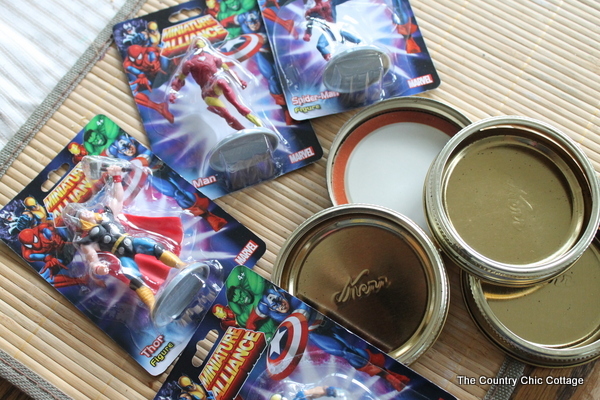 Until then you can make a set of my super hero toy storage jars to celebrate the movie. 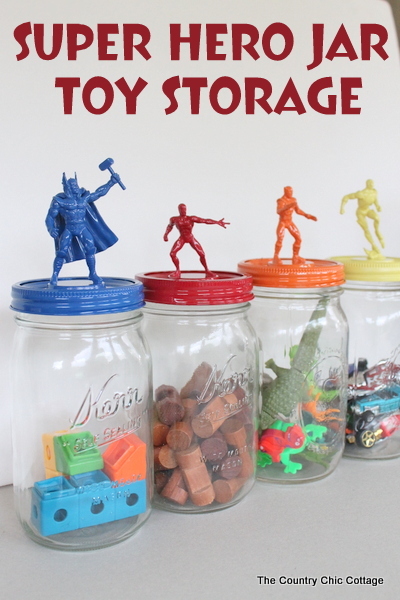 After all every little boy will love a set of colorful super heros to organize their toys. Then they can watch their favorite buddies in Disney Super Buddies later this month. 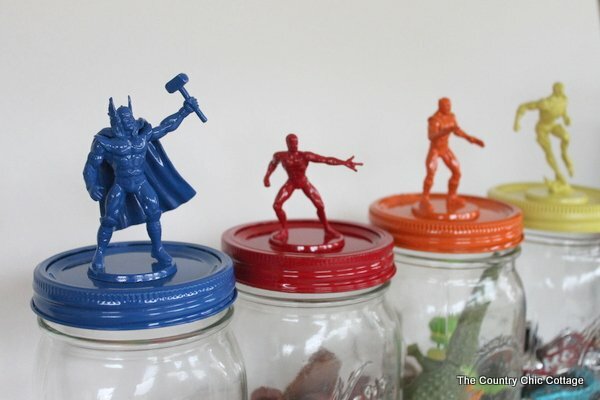 To make your own super hero jar toy storage, grab some super hero figurines at the dollar store. 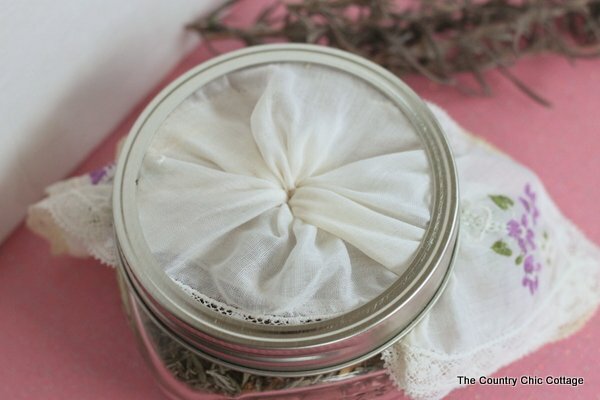 Use hot glue to secure the lid inside the band of your jar tops. 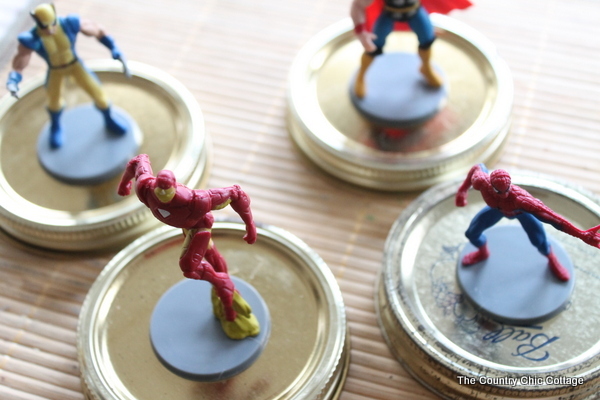 Then use hot glue to add your super heros to the center of each lid. Spray paint each lid in a different color. It took several coats of spray paint to get the look you see below. Allow your figures to dry completely before handling. 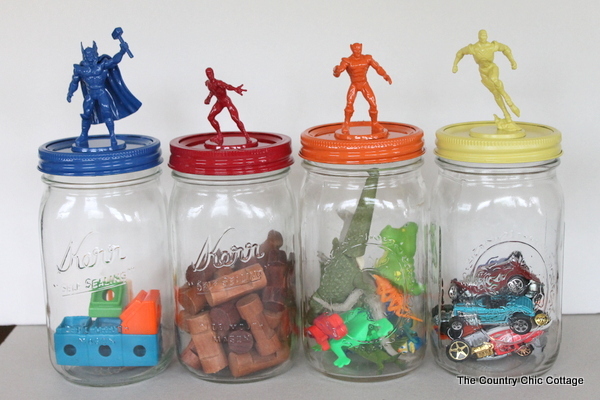 Add toys to your wide mouth mason jar and then screw on your super hero tops. Toy organization never looked so good! Now get ready for an epic tail on August 27th with Disney Super Buddies. We are huge buddies fans around here. The series are great entertainment for the entire family. Plus giggles from little boys and girls are the perfect way to end a stressful week. Be sure to have a family movie night when the Super Buddies Blu-ray DVD combo pack comes to a store near you. You can follow along with those crazy Disney Buddies on facebook and Pinterest. Plus visit the official Disney Super Buddies website for more information on the movie. Want even more Super Buddies and super hero fun? Be sure to visit all of the great projects below as well. I was compensated for this post but all projects and opinions are my own. 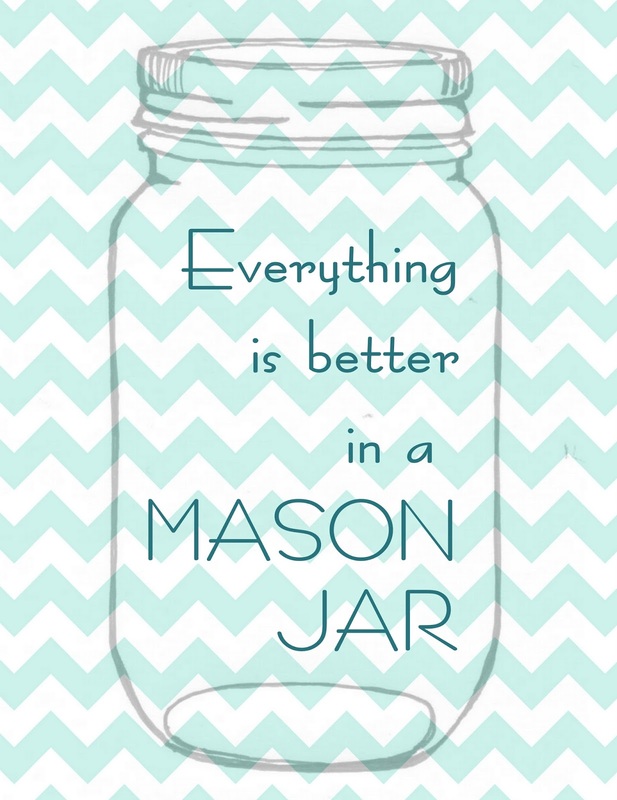 Y’all seem to love my free printable mason jar art so much I came up with another version. Everything is better in a mason jar. You all think that too right? Grab your free printable art below to display in your home. 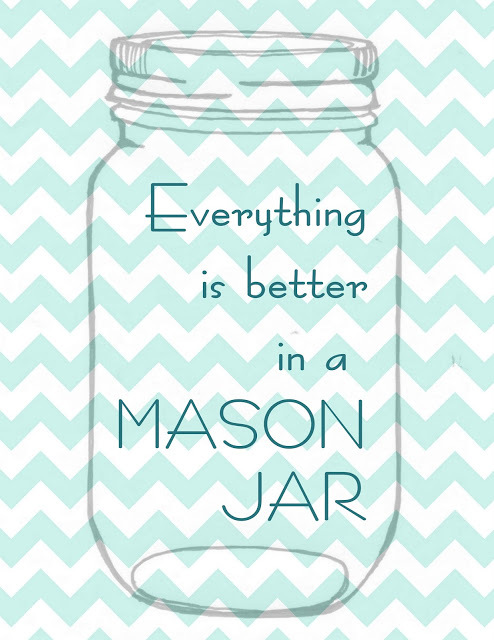 Have you missed my other mason jar printables? Be sure to print my mason jar firefly art and my money can’t buy happiness but it can buy mason jars art. Now for the next version. Click on the image below or head over to download my free printable here. Then you can print your own version up to 8 x 10. Frame it, hang it, display it, but most of all enjoy it!